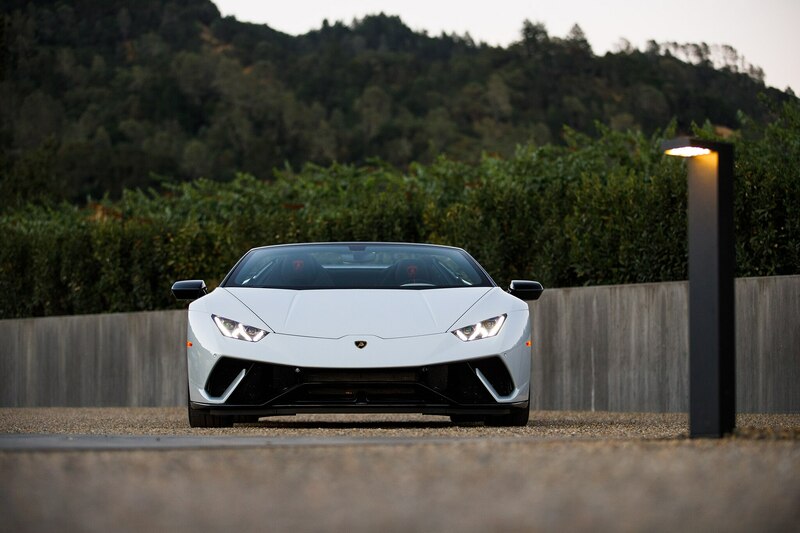 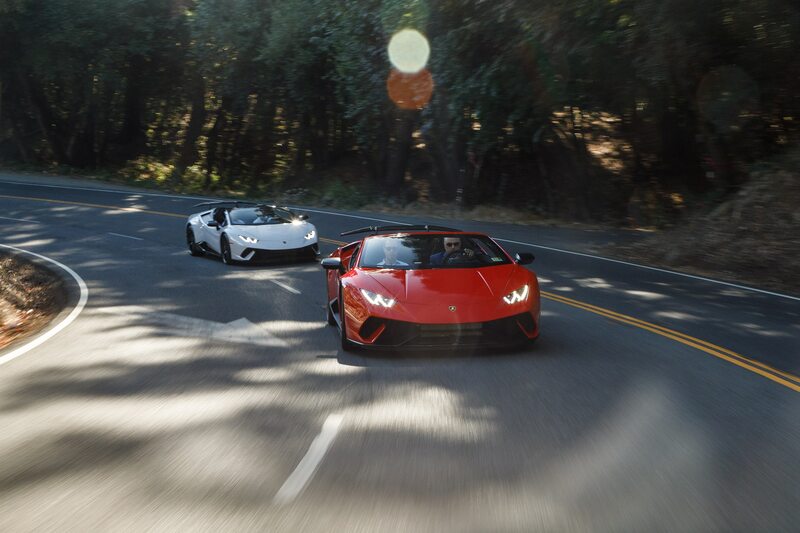 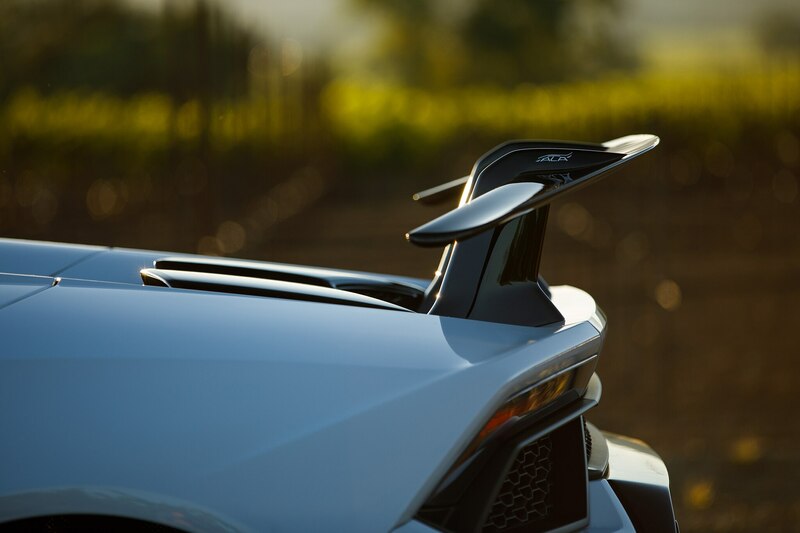 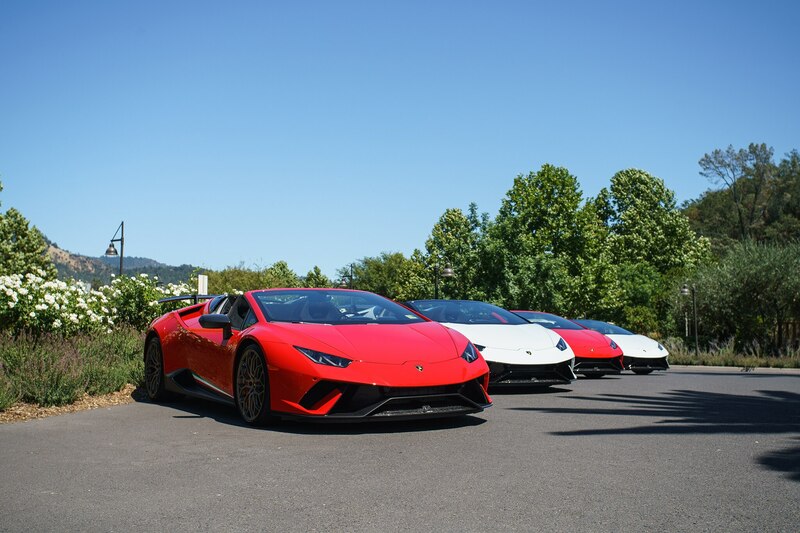 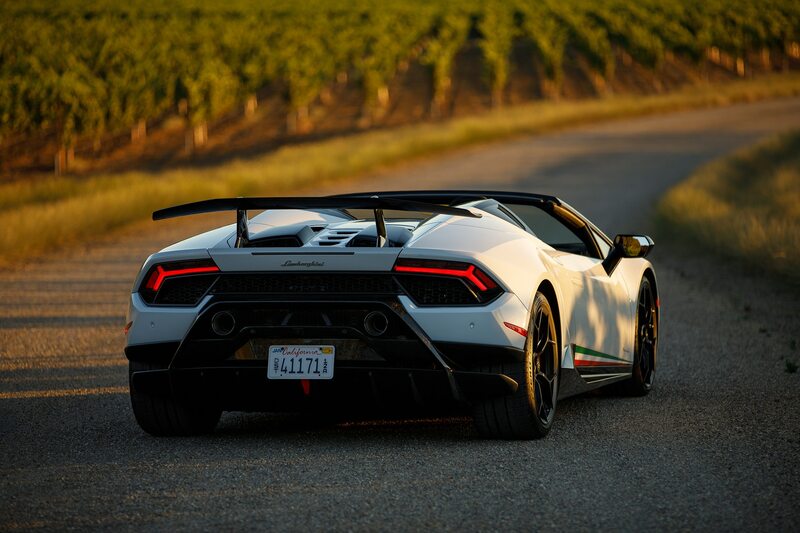 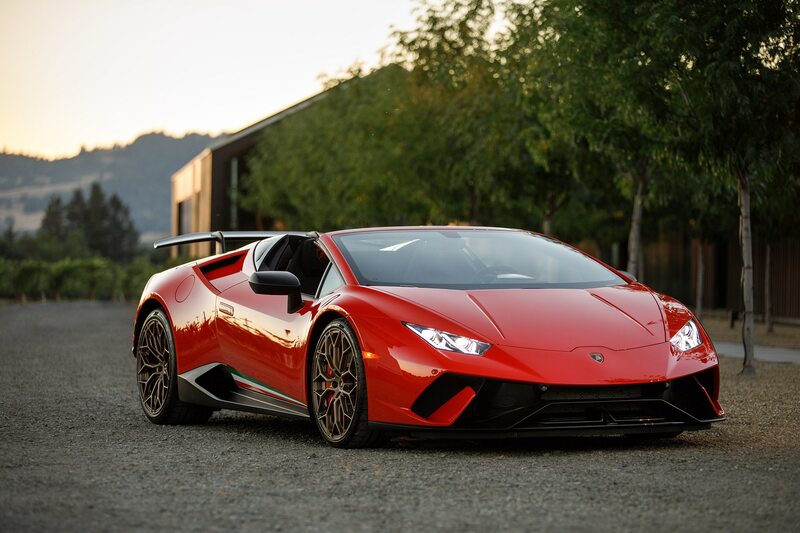 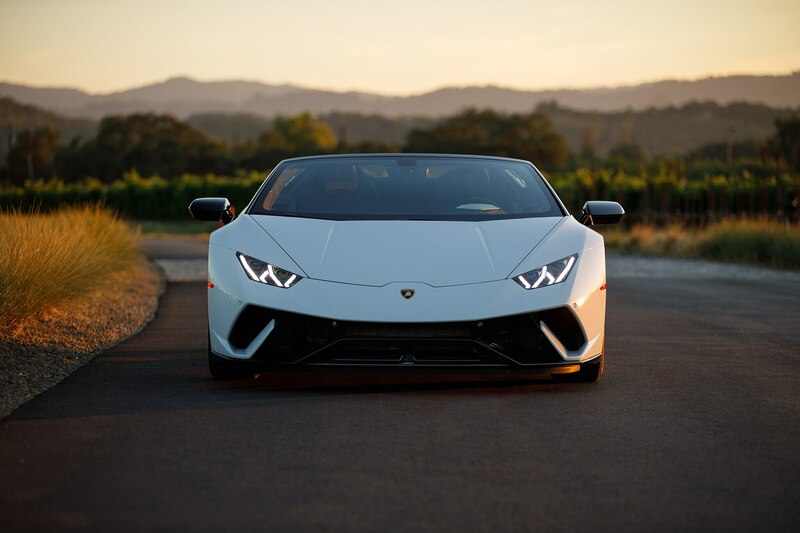 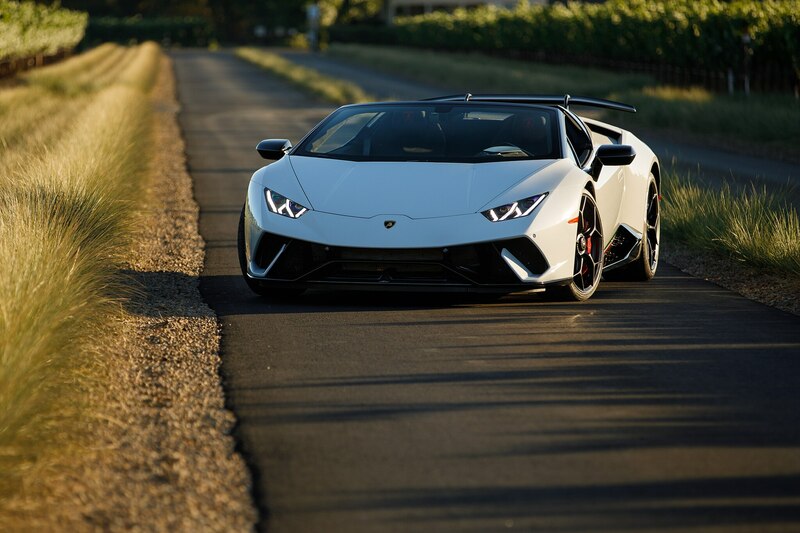 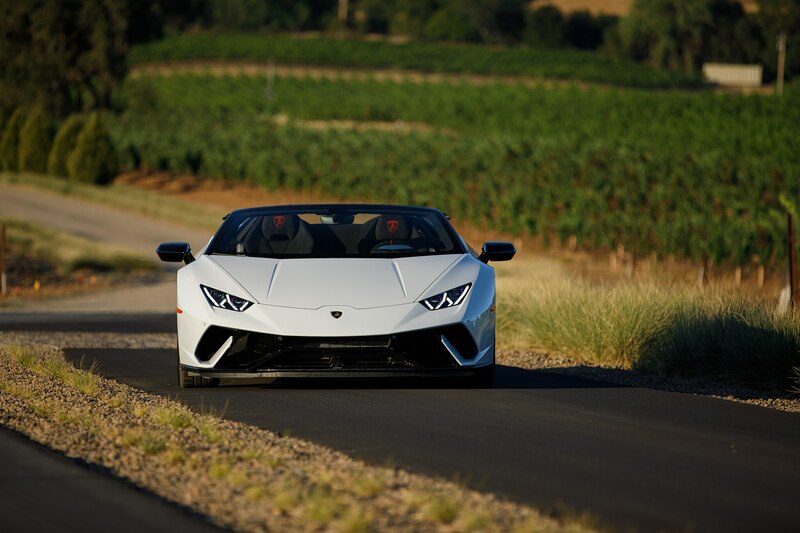 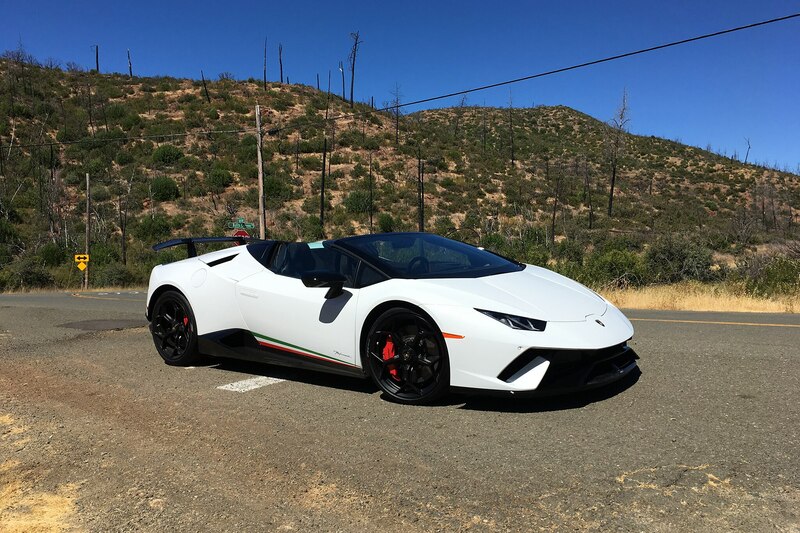 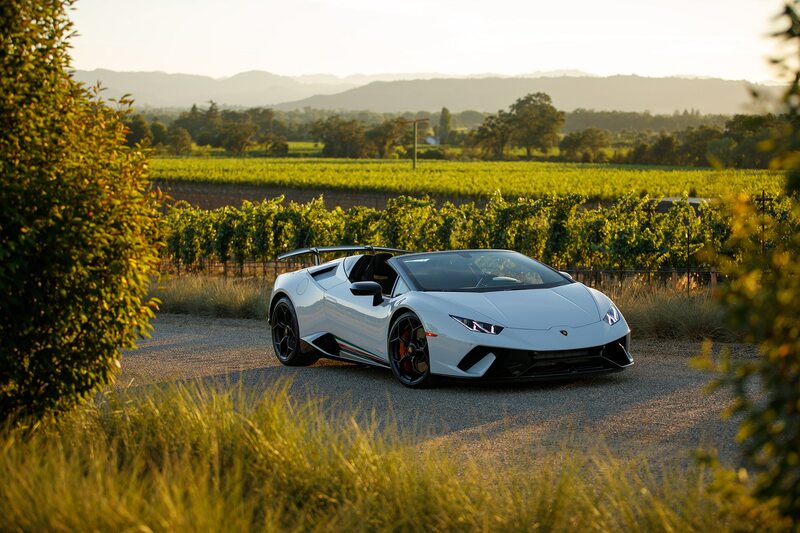 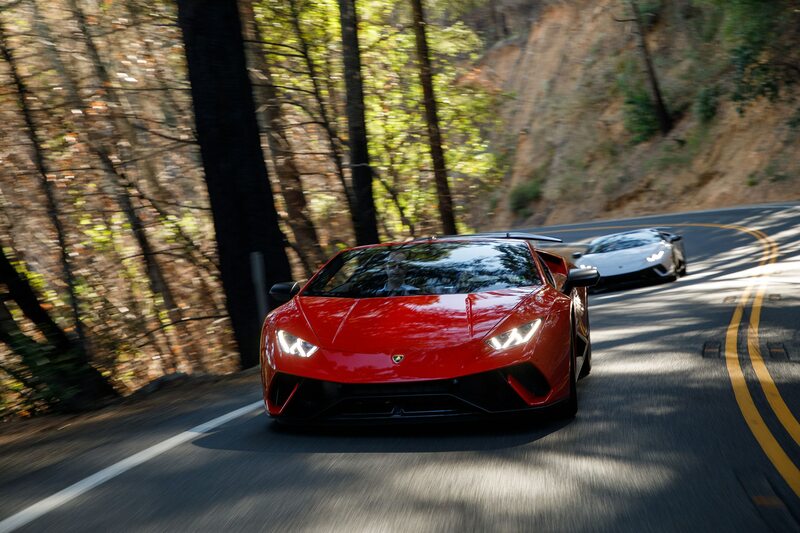 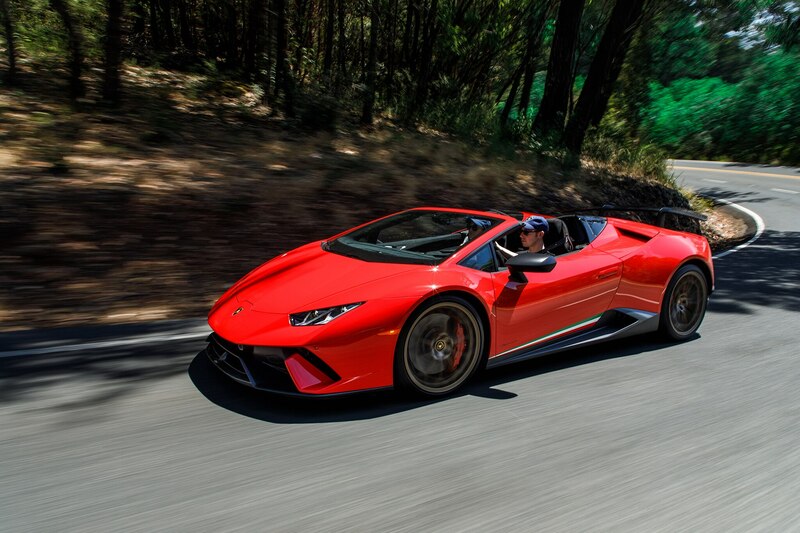 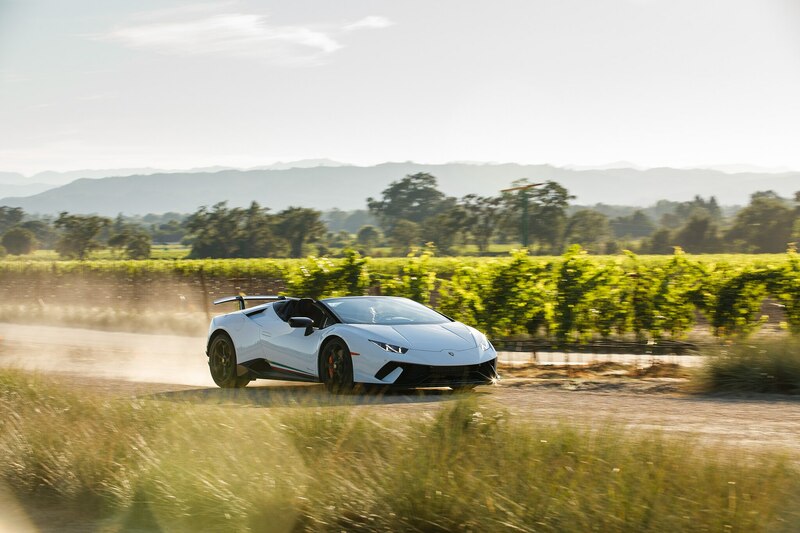 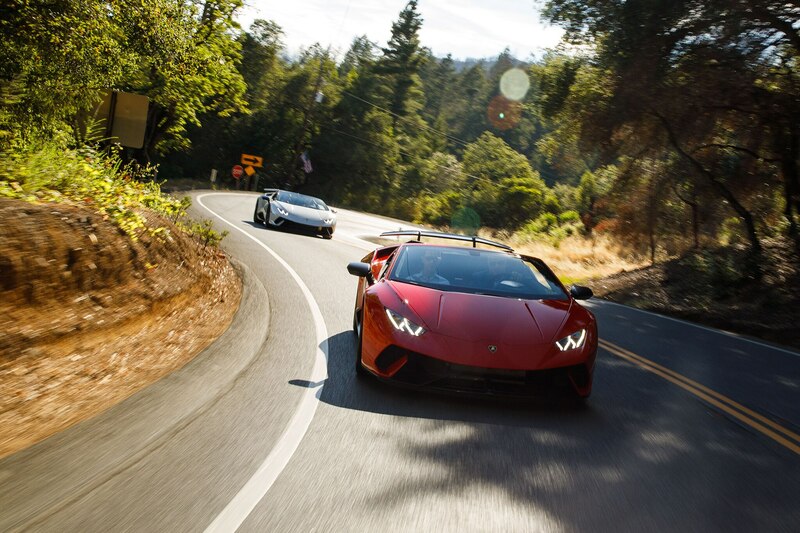 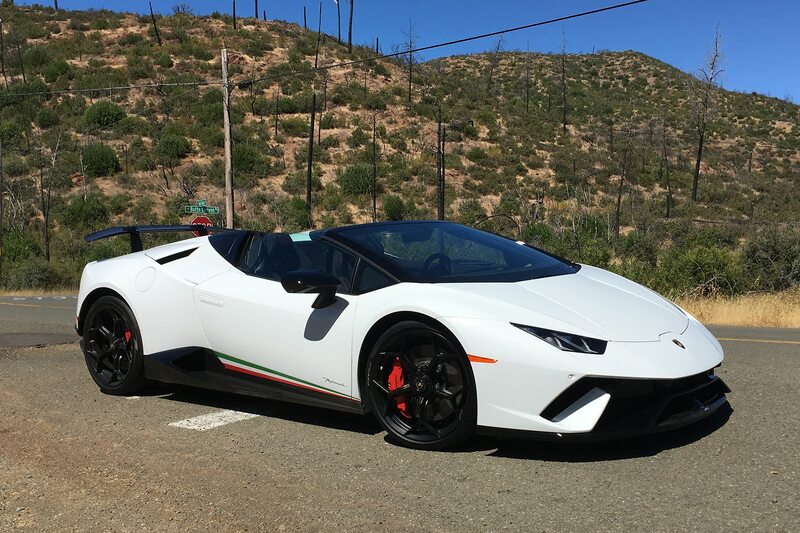 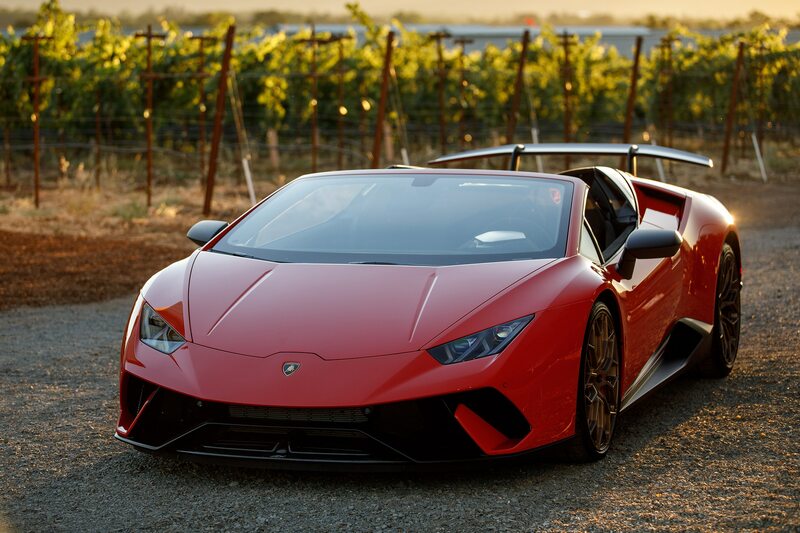 CALISTOGA, California — When Editor Mike Floyd sent me to review Lambo’s latest, I vowed that I would cover it like the jaded, sober professional I imagine myself to be—but that all went out the window the moment I opened the taps on the 2018 Lamborghini Huracán Performante Spyder’s 630-horse V-10. 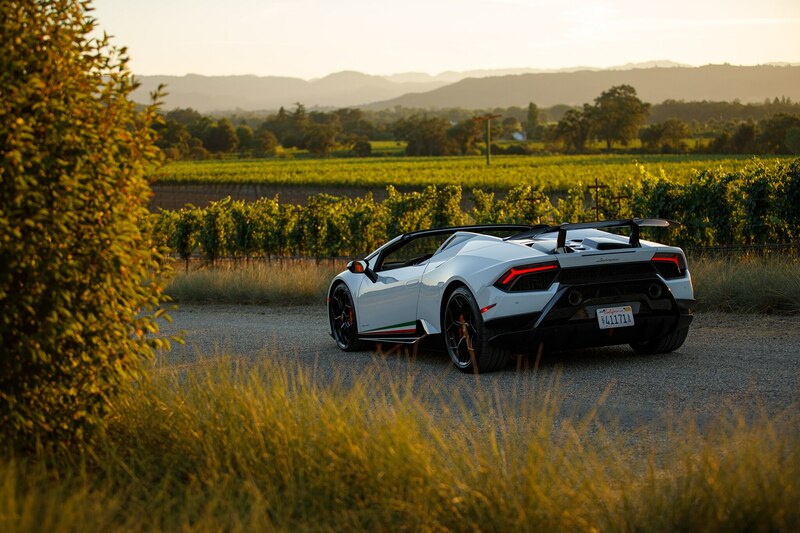 Bombing through the back roads of Northern California in a brand-new supercar on behalf of an A-list car mag is something I’ve dreamed of doing for years, and if you’re going to live the dream, there is no better ride than this. 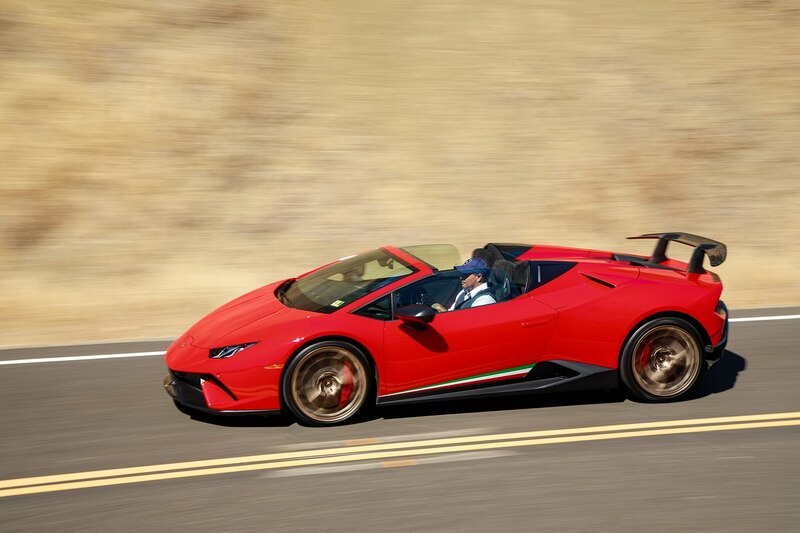 What is the Huracán Performante Spyder? 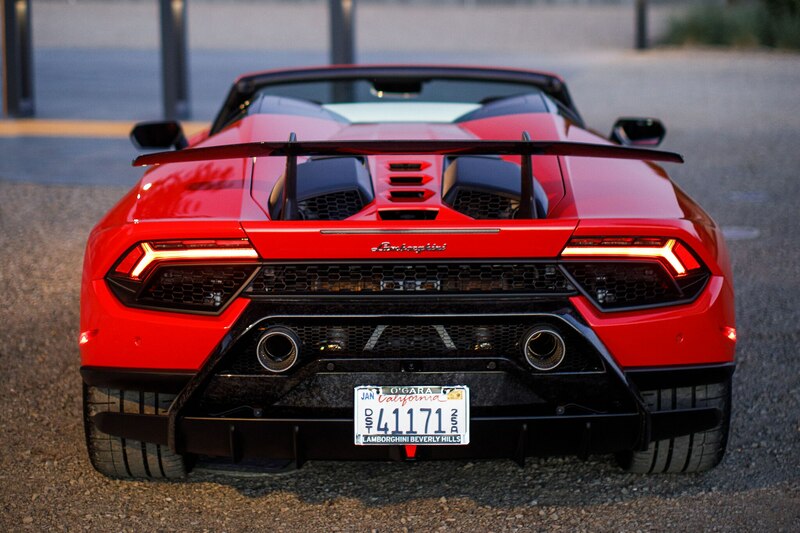 It’s insane, that’s what it is. 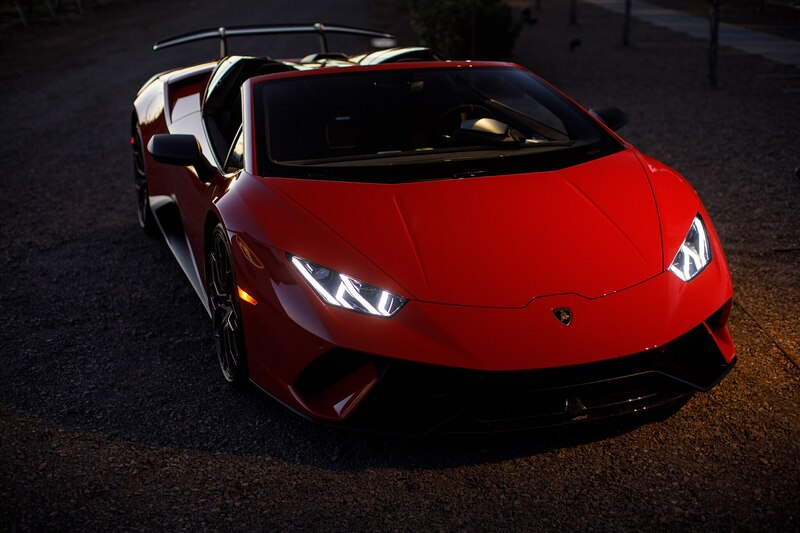 It is a road-going elephant gun that transforms mere mortals into driving deities. 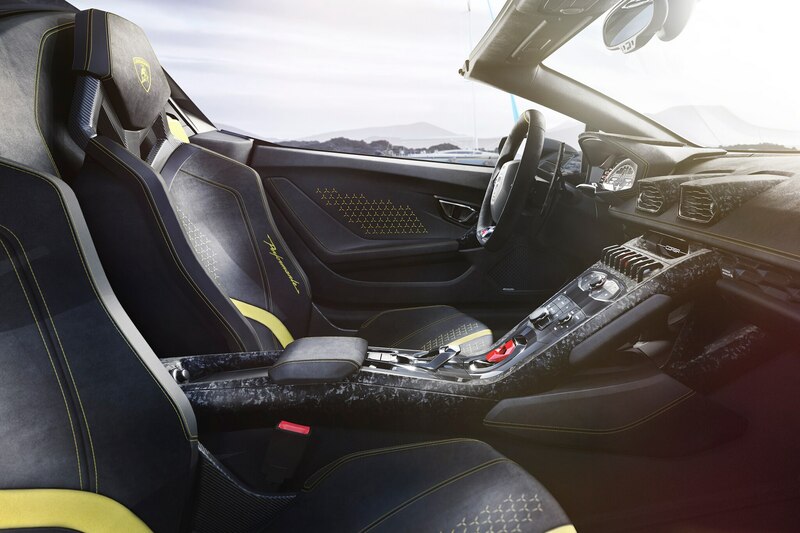 It’s the ride that earns you looks of smoldering jealousy from drivers of high-end Porsche 911s. 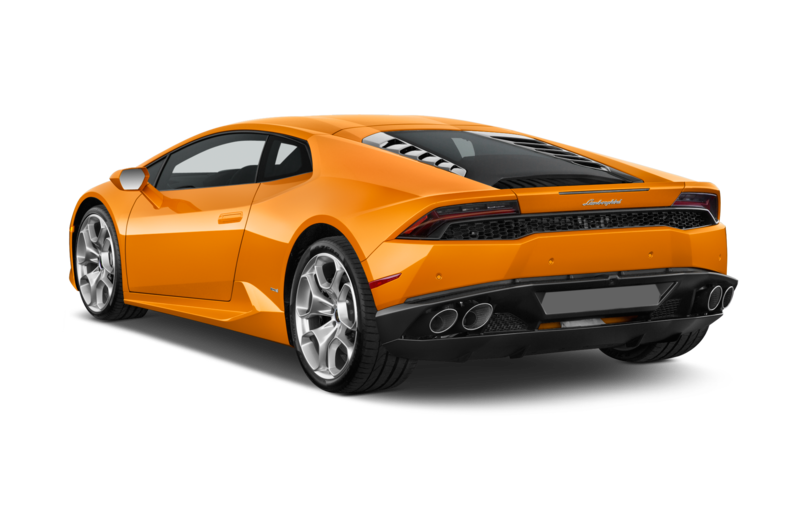 It’s the car that Aston Martin owners can’t quite afford. 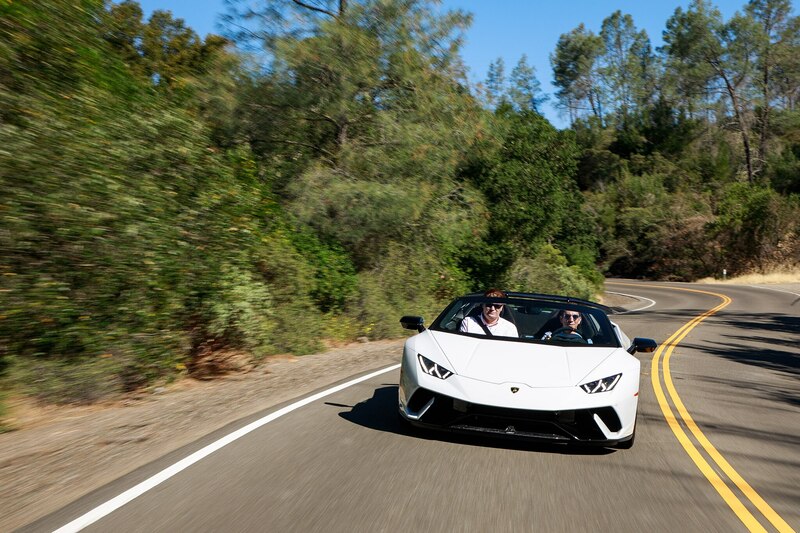 It is the passport to a lifestyle that 99% of us—especially those of us who chose to write about cars for a living rather than do something more lucrative, like working at a 7-11—can only dream about. 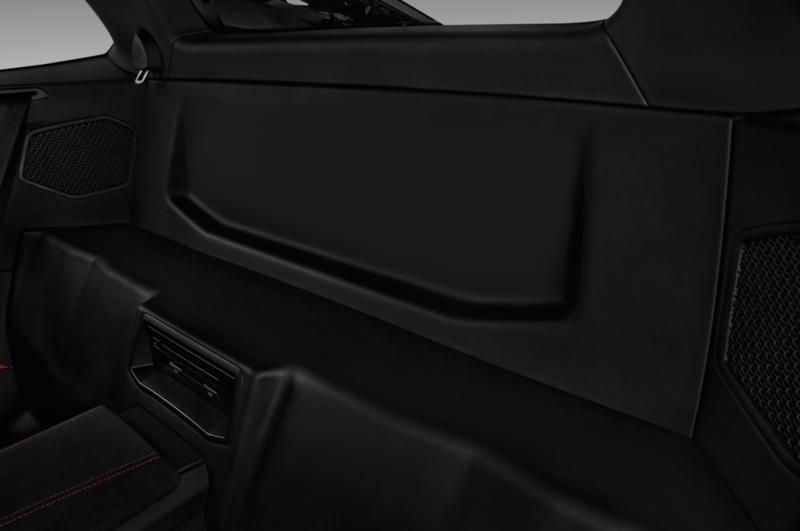 It’s also a little cramped, very noisy, and has the world’s silliest turn signal switch—nuisances that the Beautiful People never tell you about. 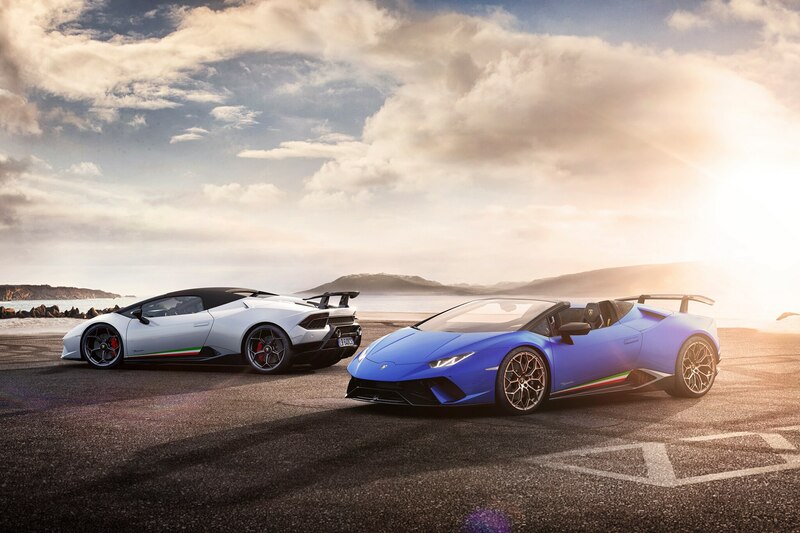 Let’s break the car down: The Huracán is the smaller of Lambo’s supercars, and the Performante version sheds weight and adds power. 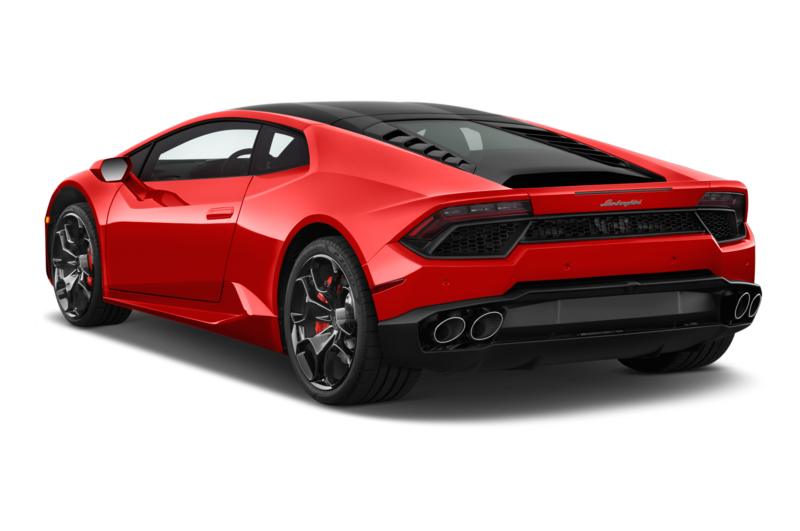 Its naturally aspirated 5.2-liter V-10 delivers 630 hp and 442 lb-ft of torque, increases of 28 hp and 29 lb-ft over the regular Huracán. 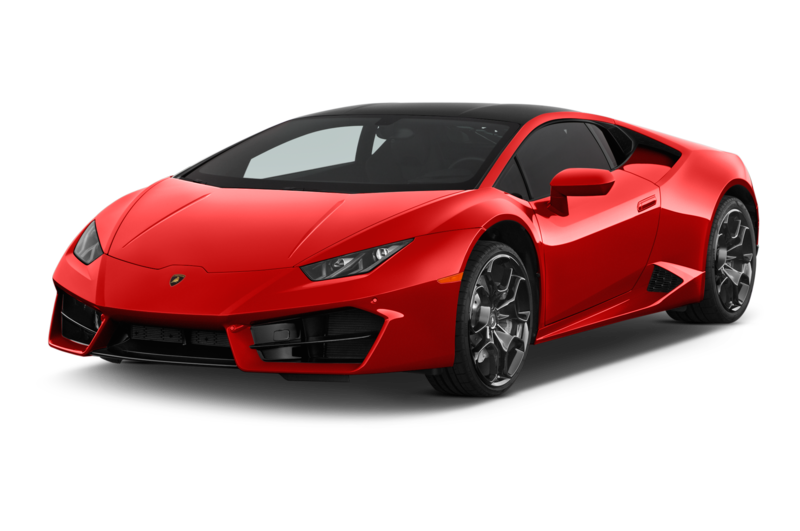 All-wheel-drive is standard, as is a dual-clutch seven-speed automatic transmission. 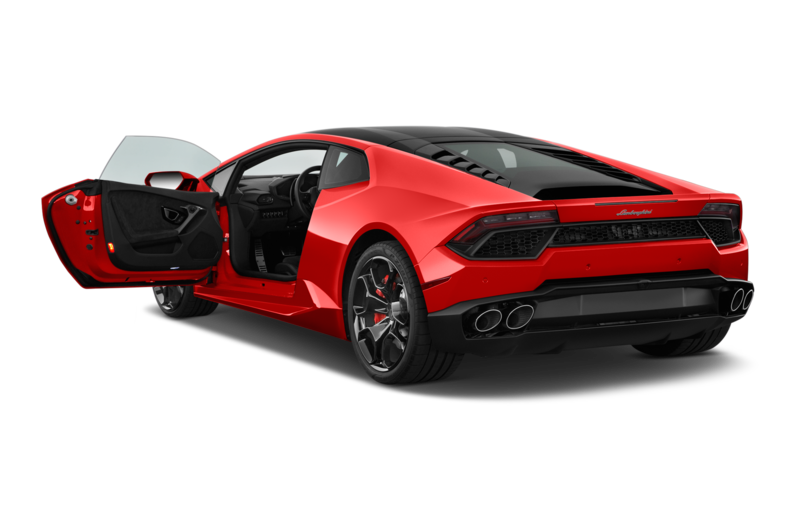 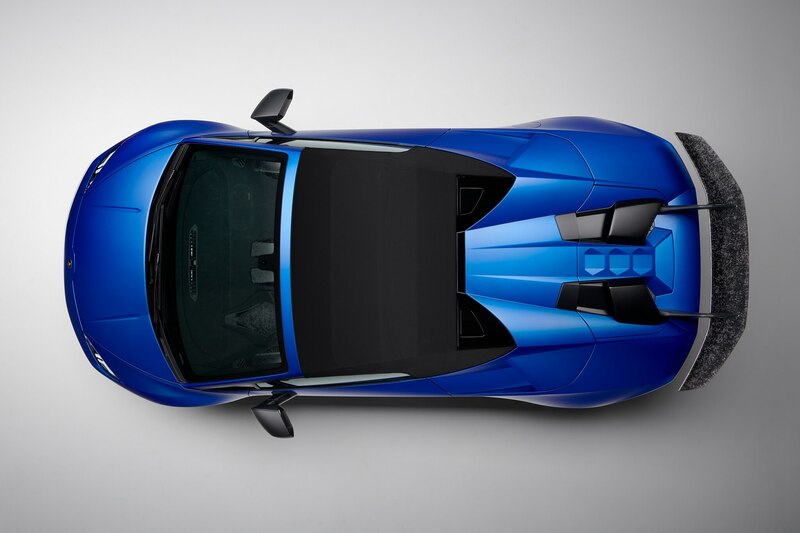 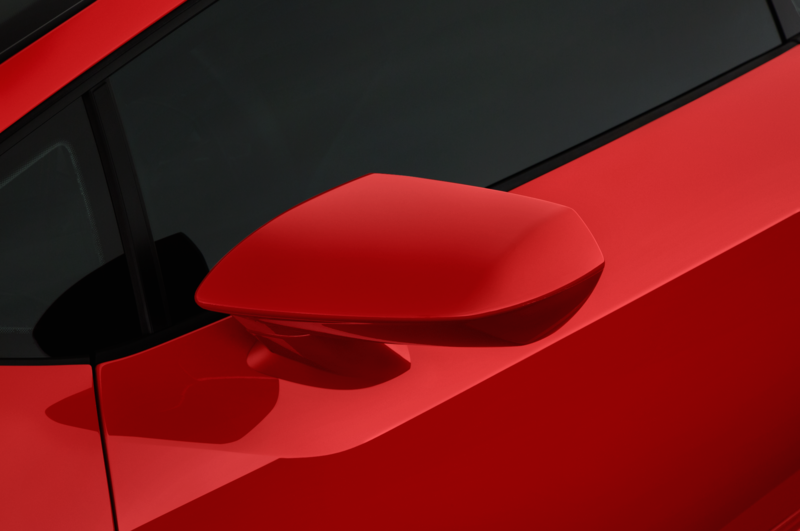 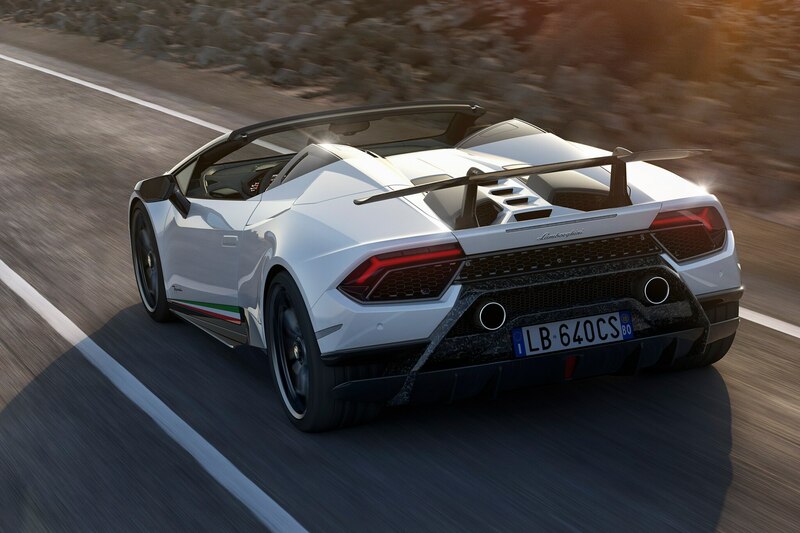 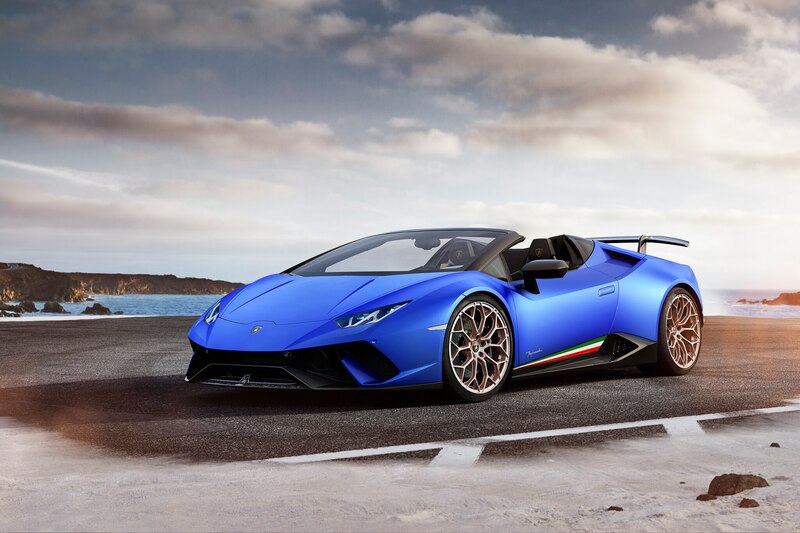 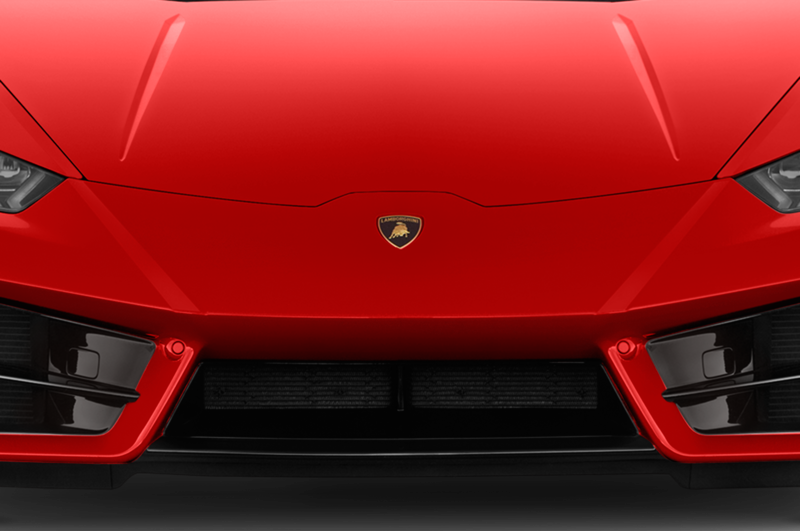 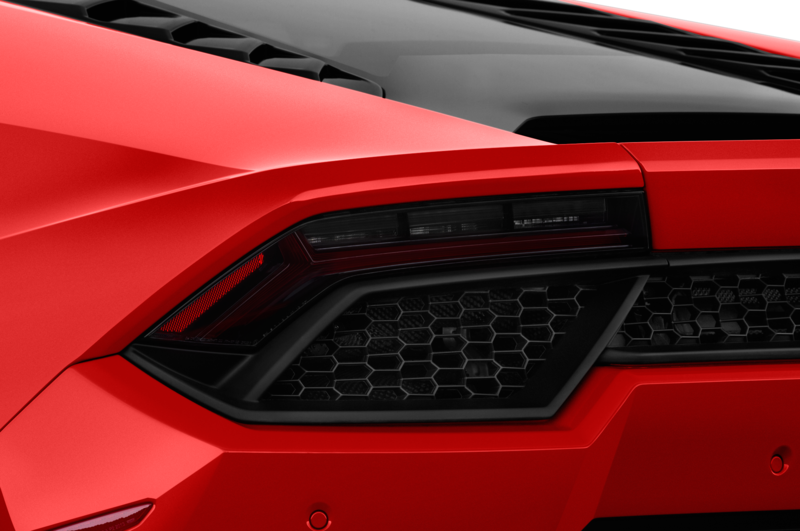 The Performante gets Lambo’s active aerodynamic system (Aerodinamica Lamborghini Attiva, a.k.a. 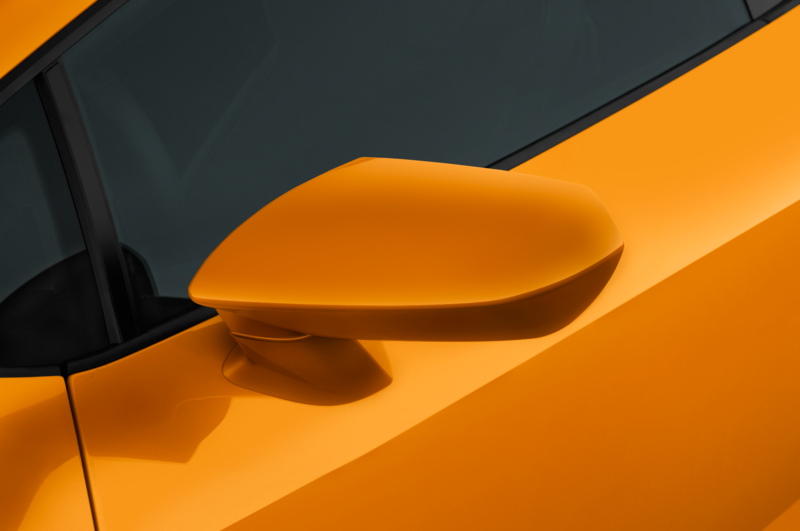 ALA). 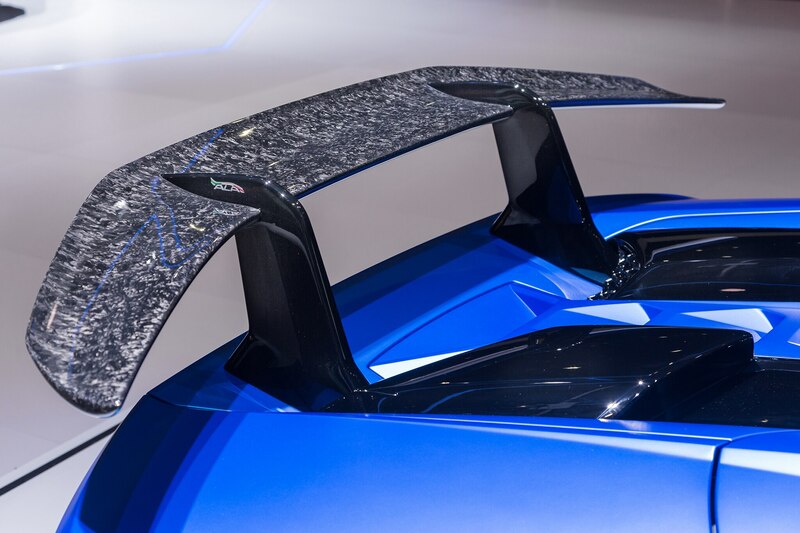 A movable flap on the front splitter either increases front downforce or reduces drag depending on driving conditions, while flaps at the base of the rear wing supports route air through the wing structure and out of vents on the underside, achieving the same effect out back. 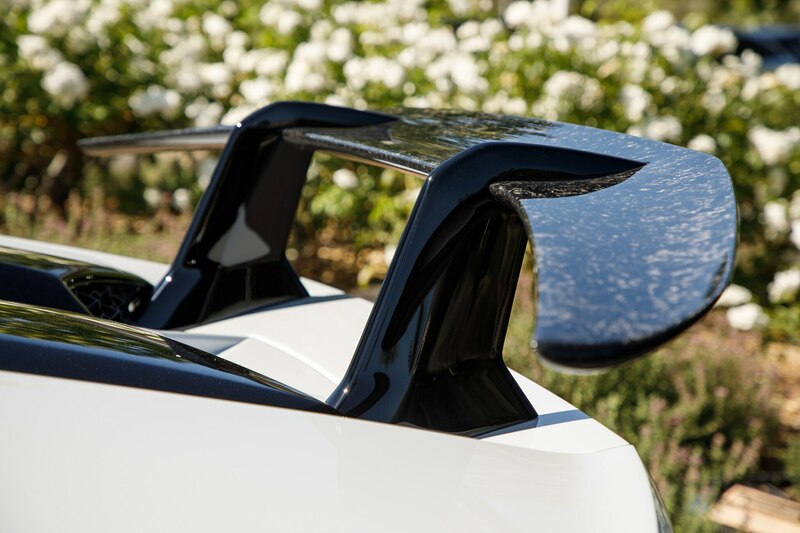 And if that’s not enough, the back end uses separate left and right channels to shift downforce to the inner rear wheel when cornering at high speeds. 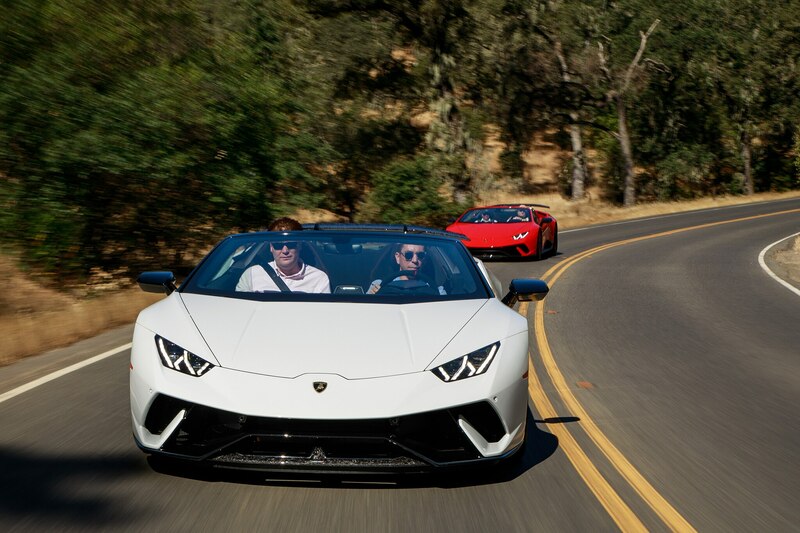 Seriously, how cool is that? 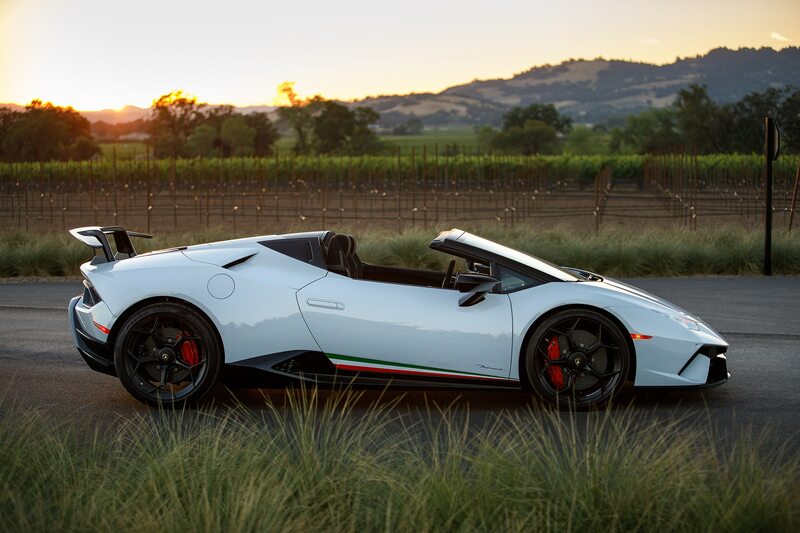 New for 2018 and the subject of my diatribe is the convertible version, the Spyder. 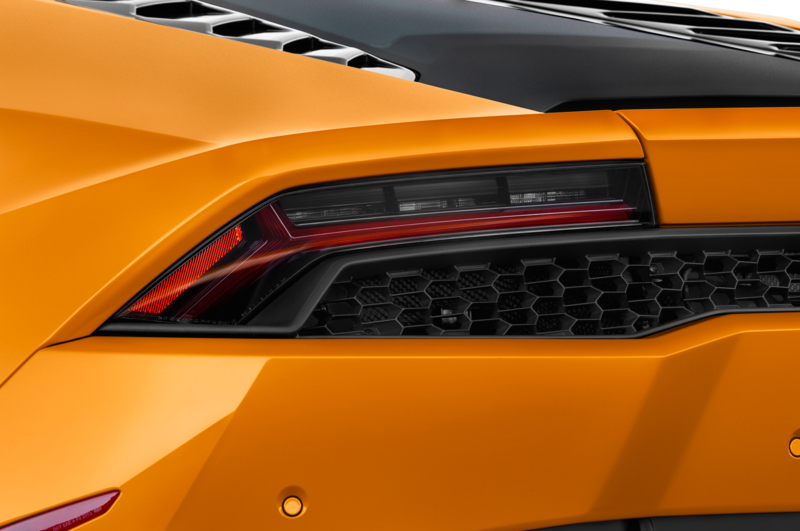 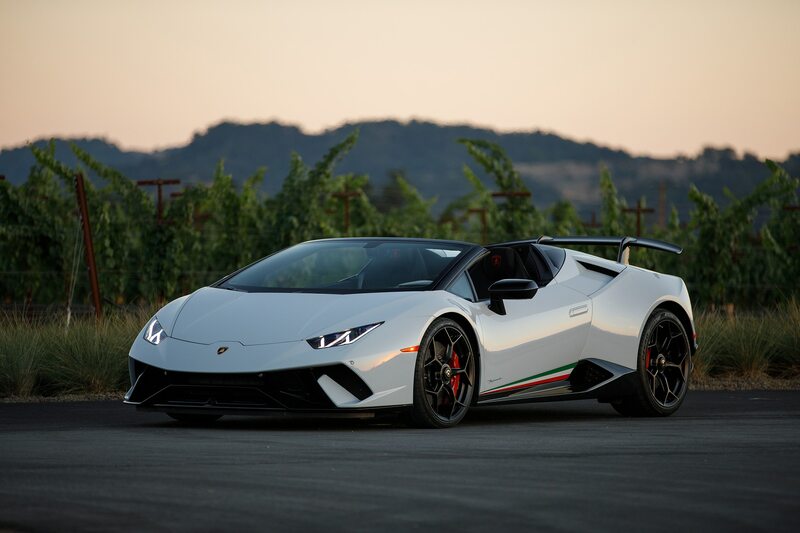 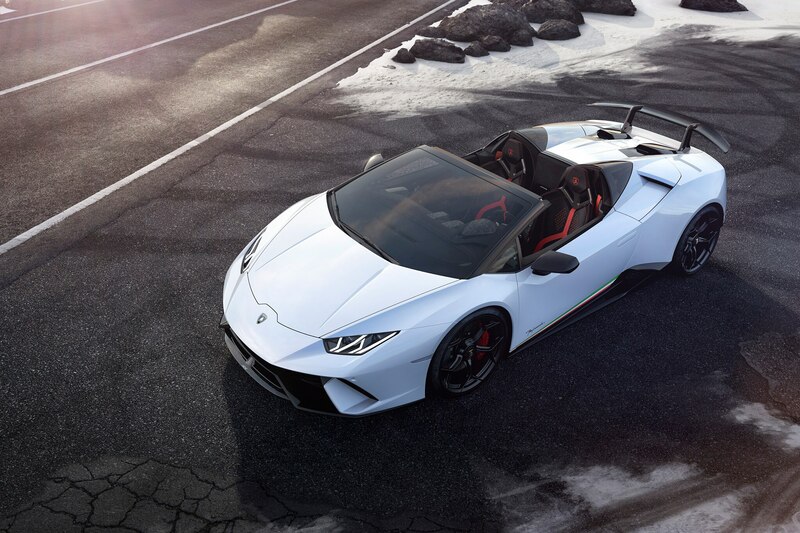 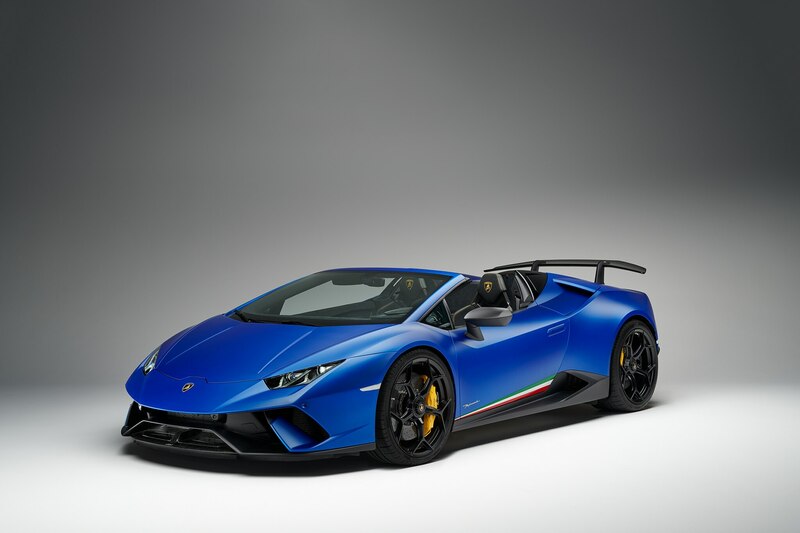 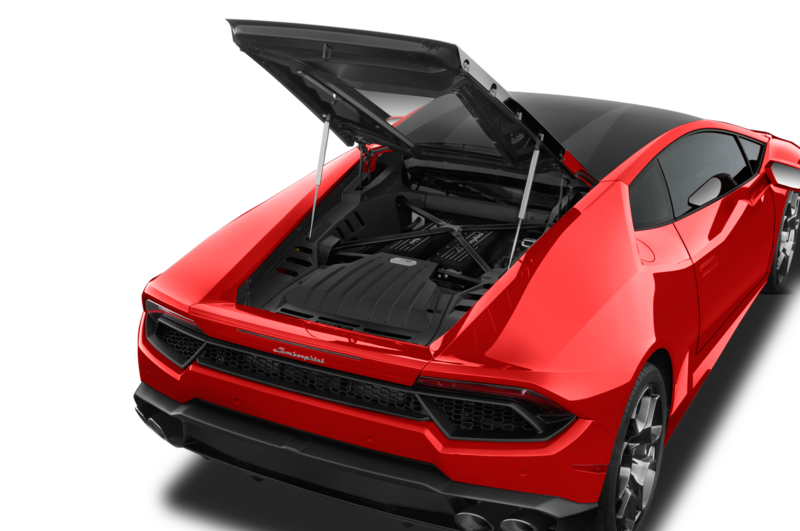 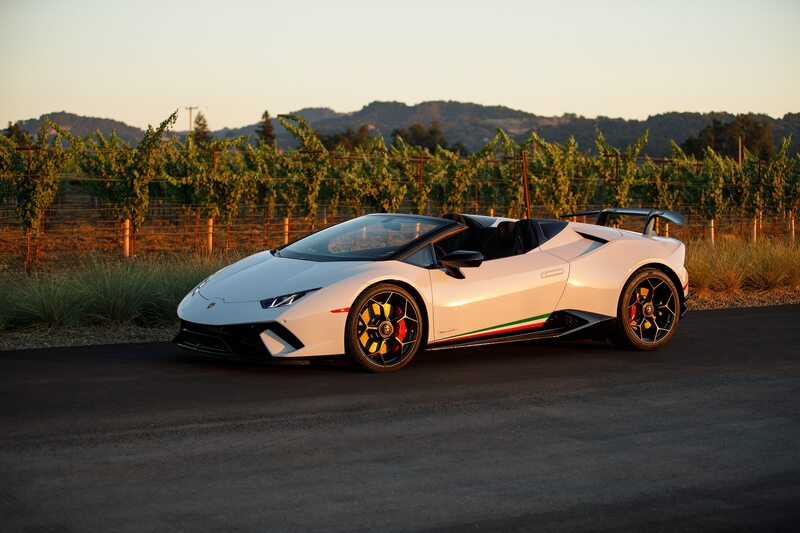 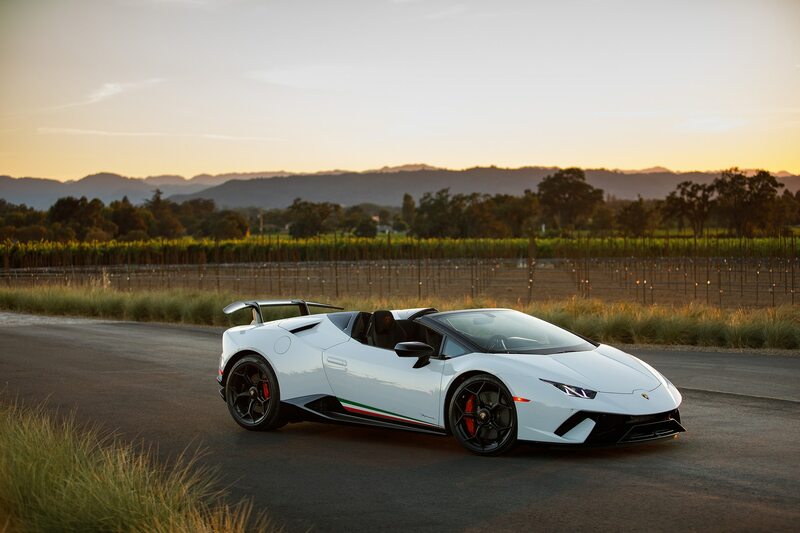 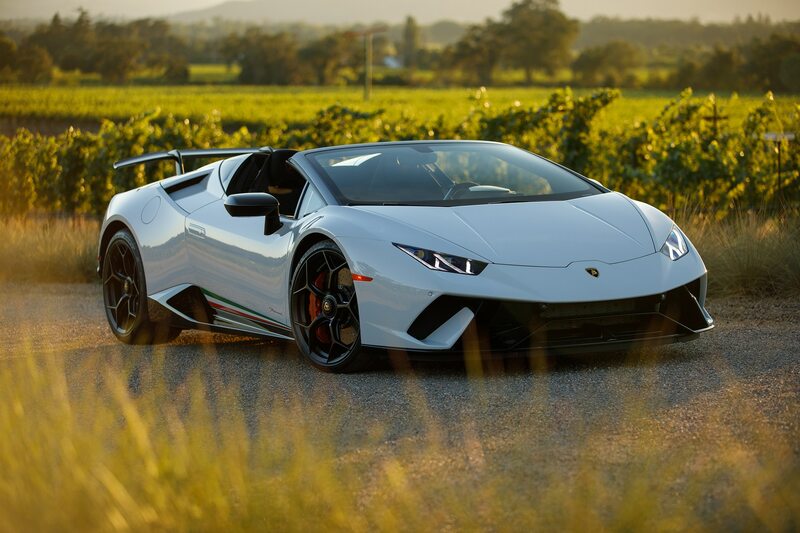 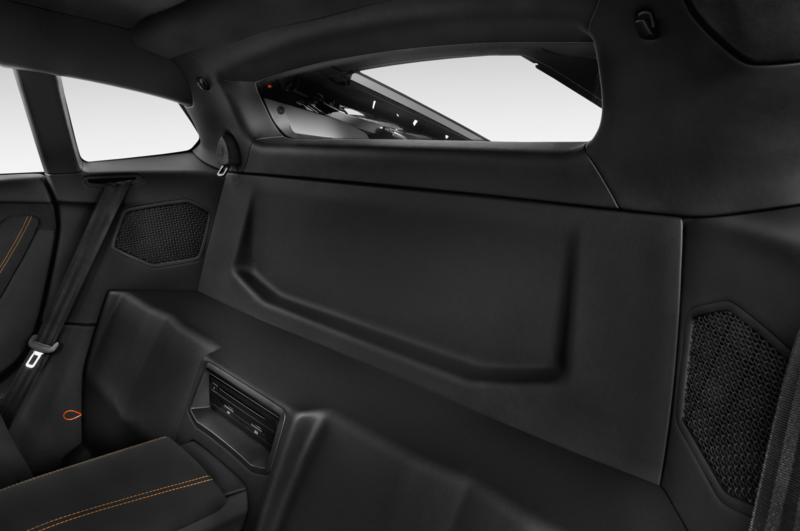 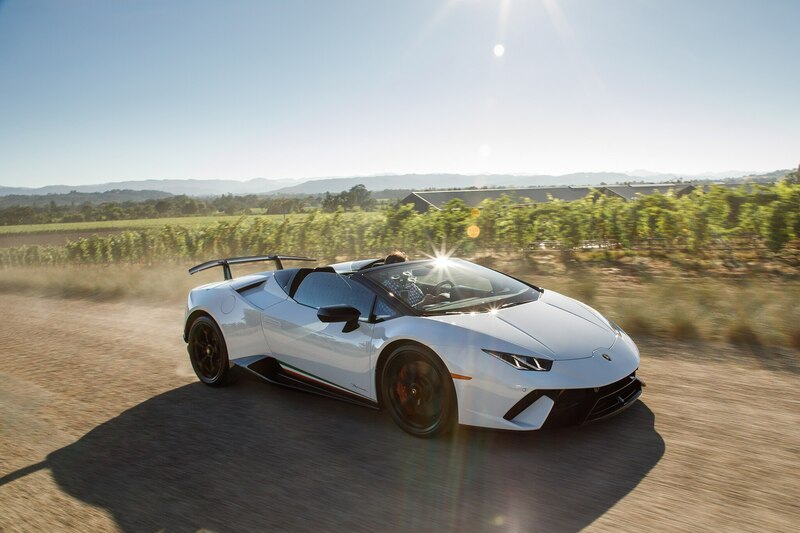 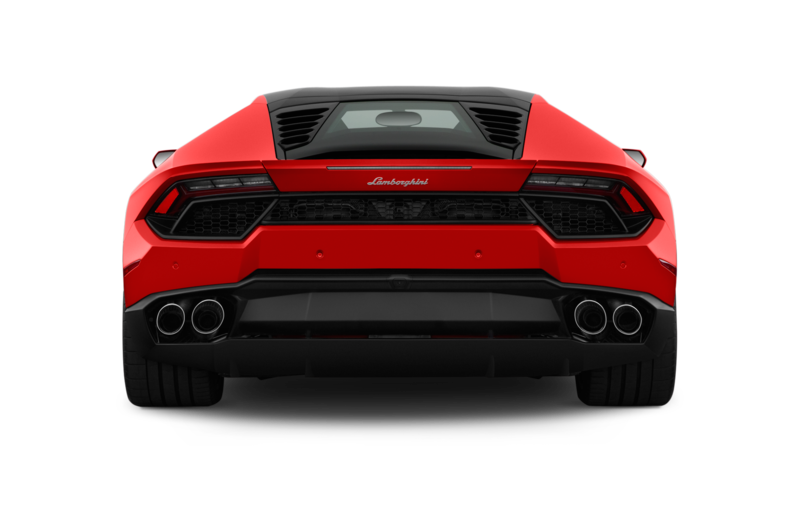 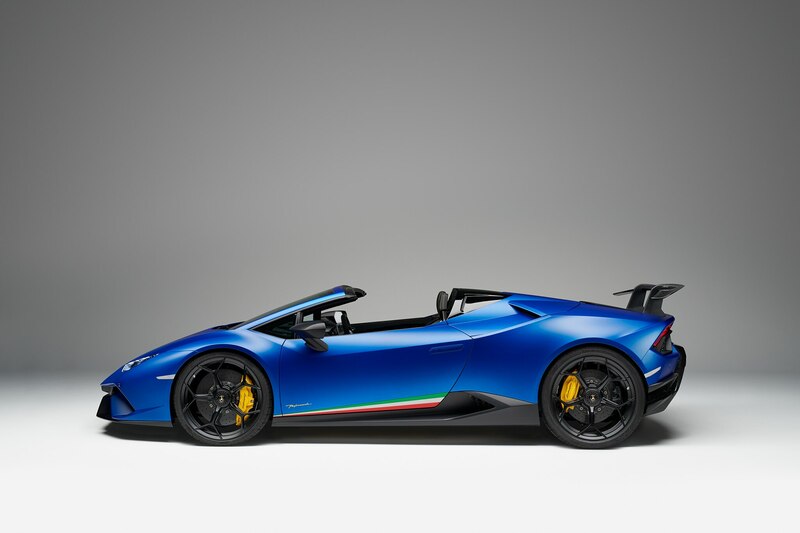 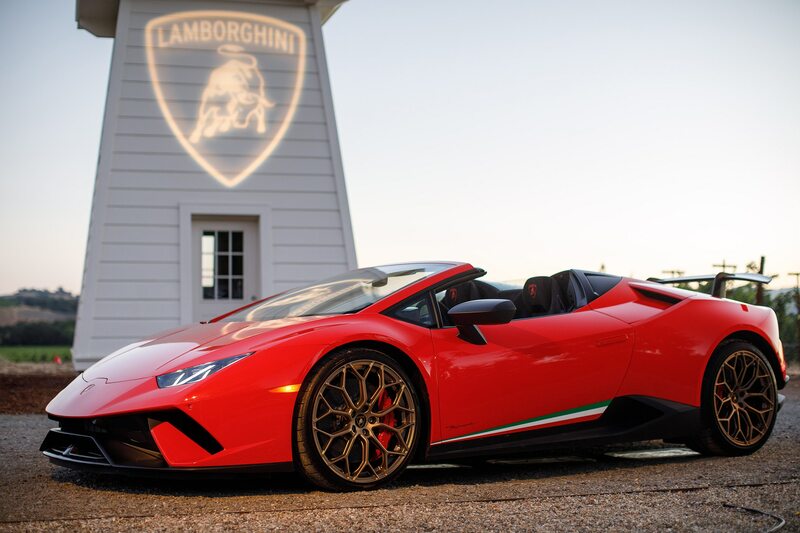 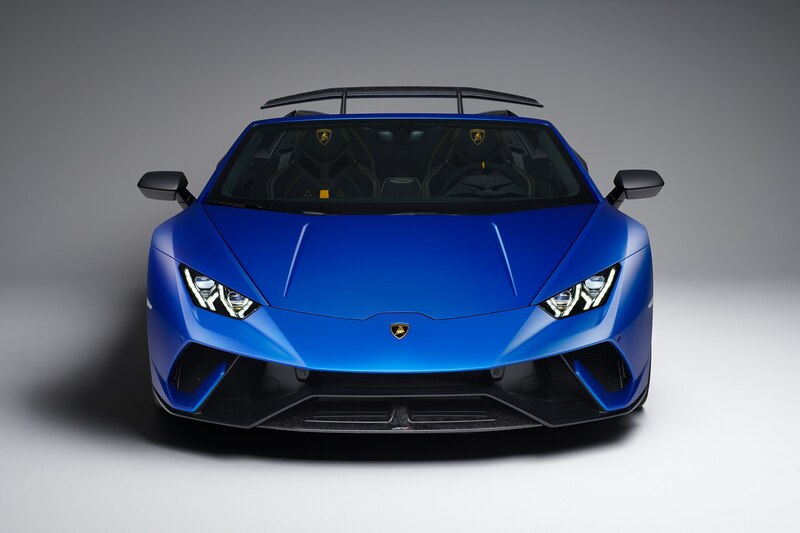 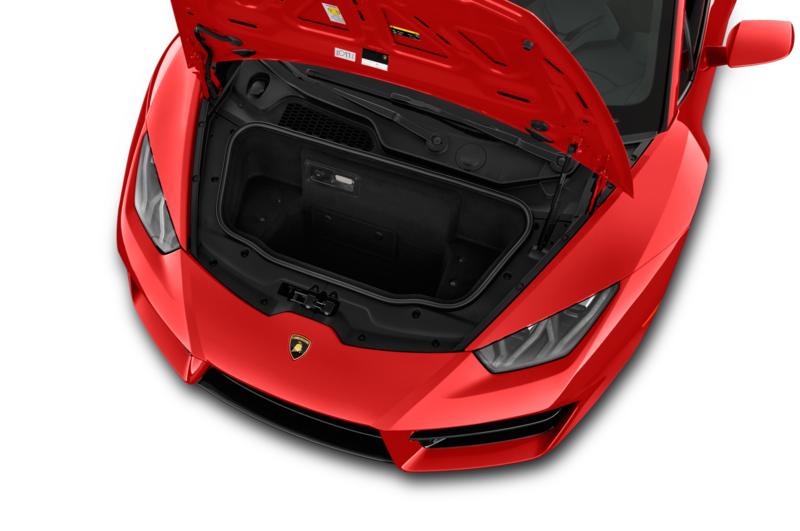 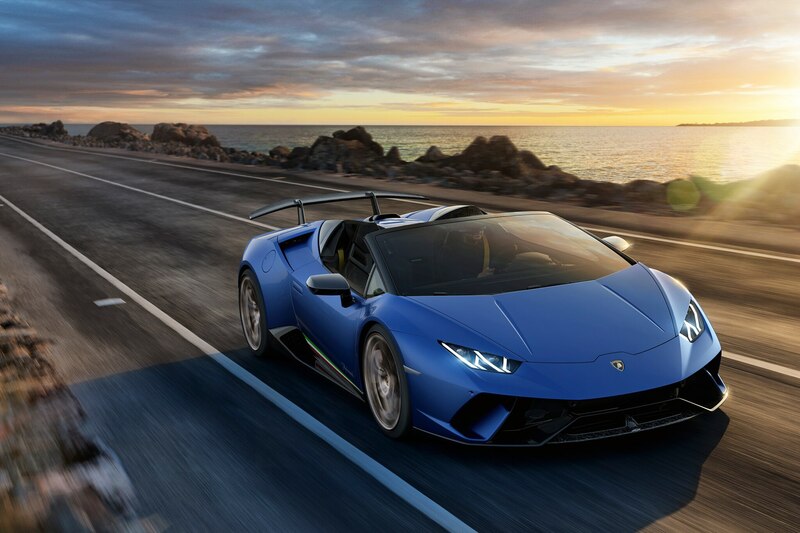 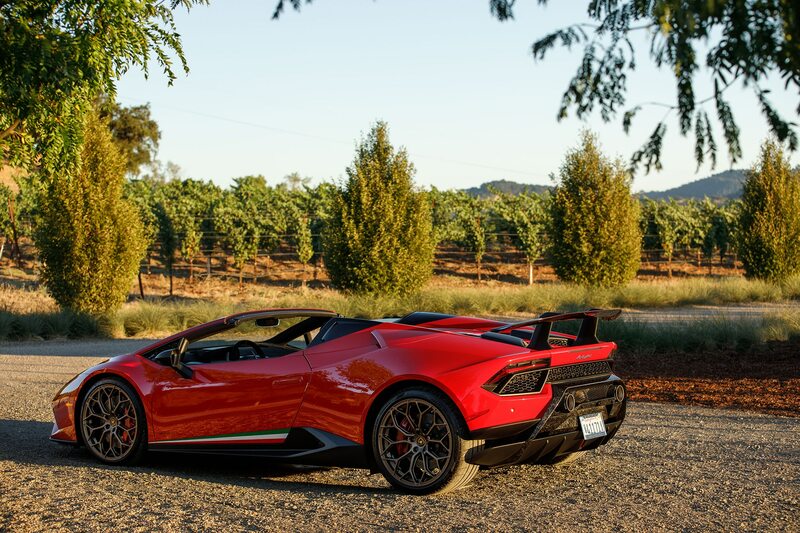 Like the regular Huracán Spyder, the Performante Spyder required no additional chassis stiffening above and beyond the coupe; the raked-back windshield delivers the required rigidity, while pop-up roll bars behind the passengers provide rollover protection. 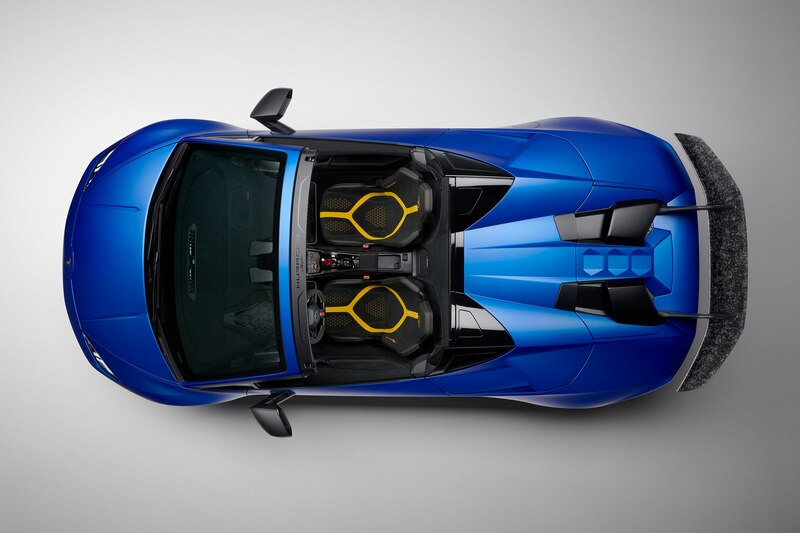 The roof is a cloth affair that raises and lowers in 17 seconds at speeds up to 50 km/h (that’s 31 mph to us ‘Muricans), and the vestigial rear window serves as a wind blocker. 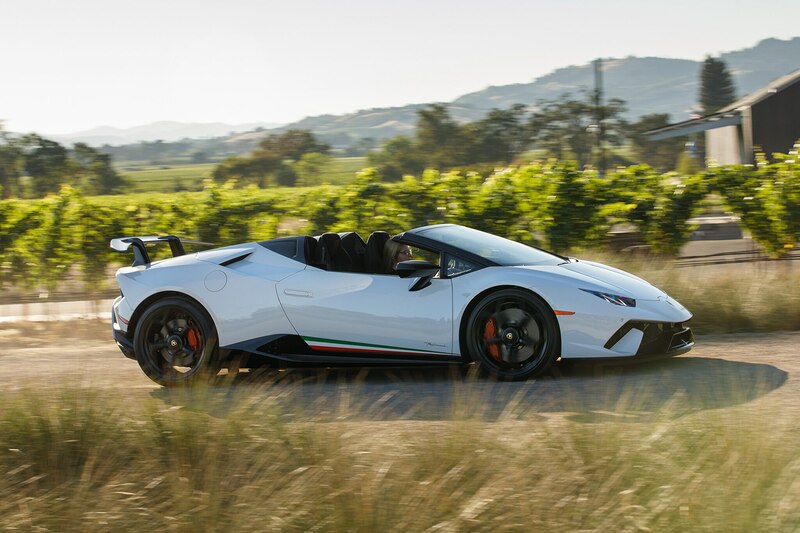 The Performante Spyder weighs 77 pounds less than the regular AWD Spyder, but it’s a hefty 276 pounds heavier than the Performante Coupe. 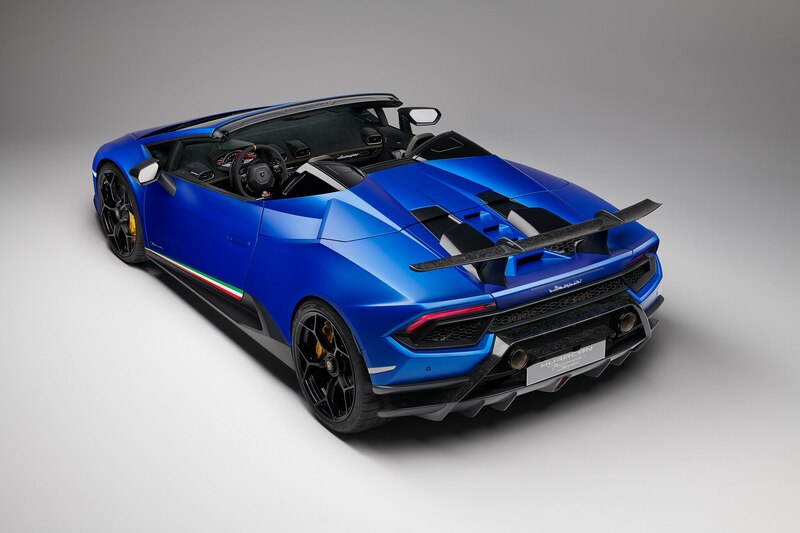 Even so, Lambo says the performance figures are close enough for jazz: 0-100 km/h (62 mph) in 3.1 seconds, 0.2 sec off the pace of the tin-top Performante, and the same 202-mph top speed. 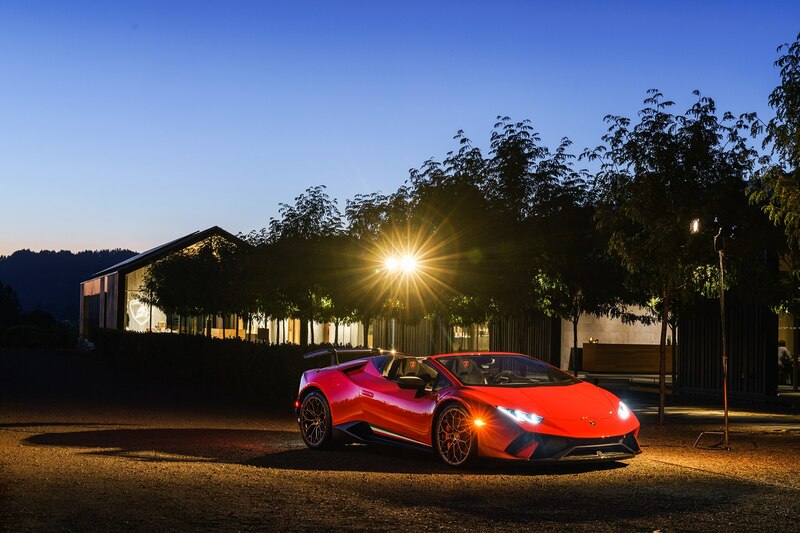 Slithering in behind the Huracán’s wheel—as that Crosby, Stills and Nash song goes, it gets harder as you get older—transforms you to a place outside of the regular automotive universe. 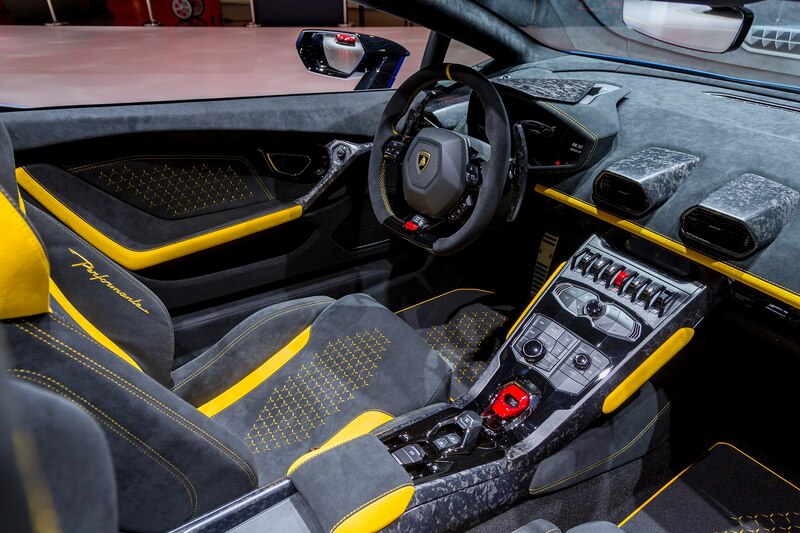 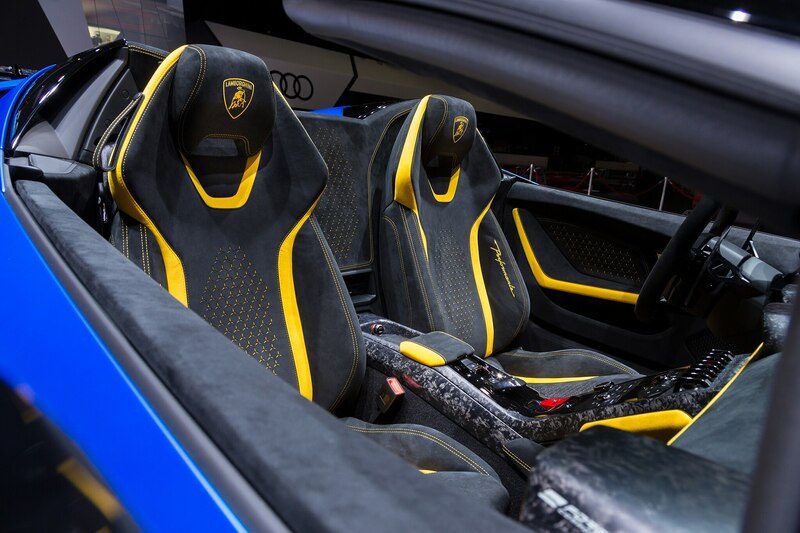 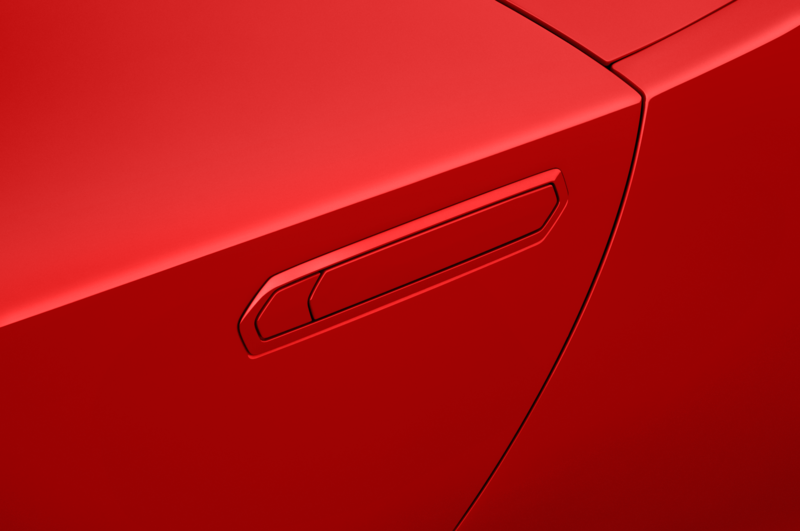 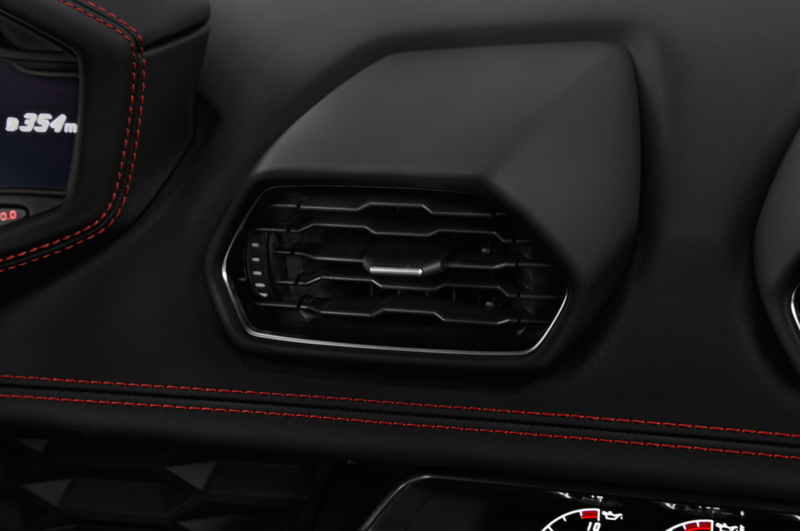 Whatever surfaces aren’t covered in Alcantara suede are molded from forged composite, a lightweight form of carbon fiber used extensively in the Performante’s underlying structure. 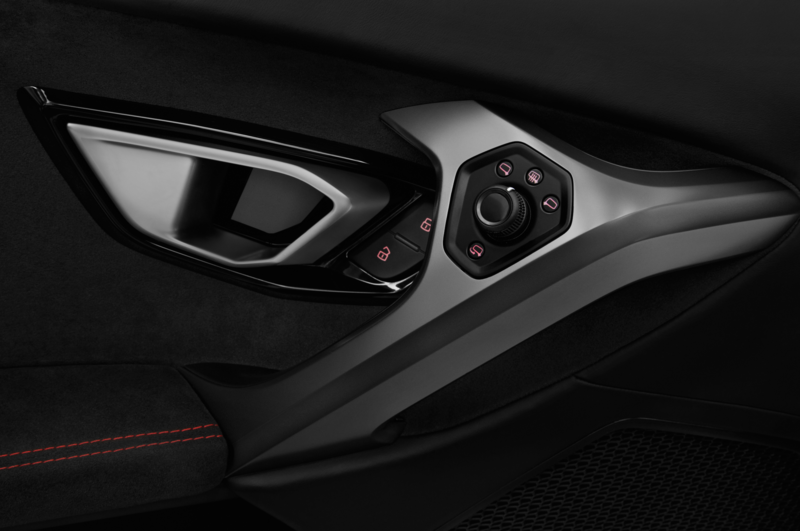 Switches are lined up like rigidly disciplined soldiers on a flowing center console. 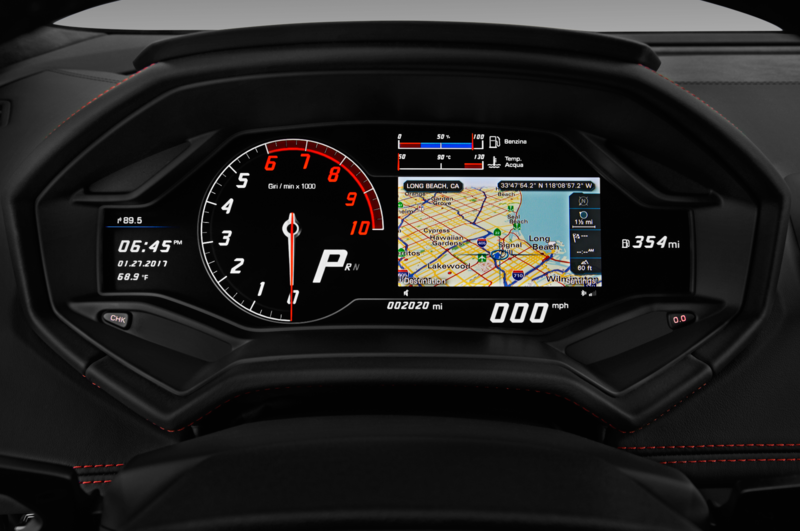 There’s no center screen; the Audi-sourced navigation system displays on the video-screen dash next to the digitally-rendered tachometer. 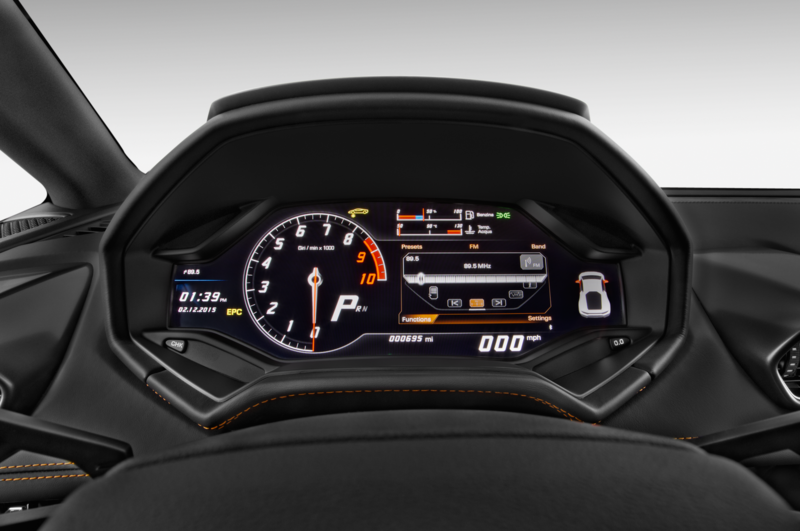 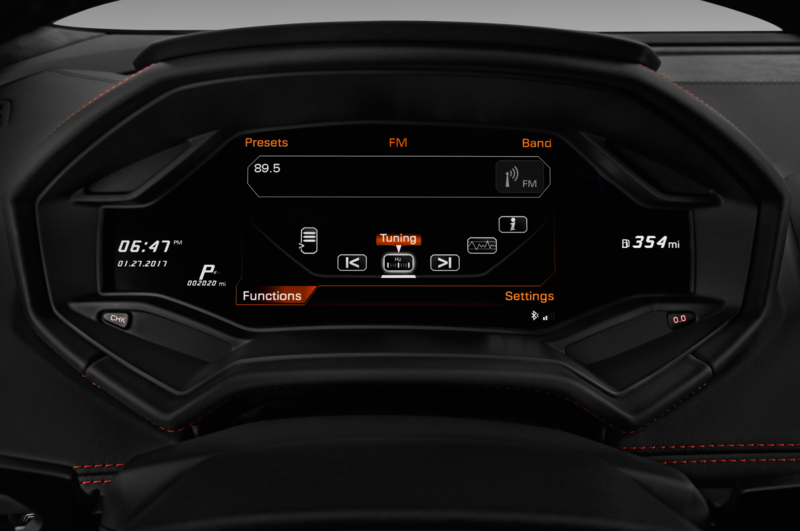 One could argue that the nav display is too small, but one could also argue that one who would pick such nits has no business driving a Lamborghini. 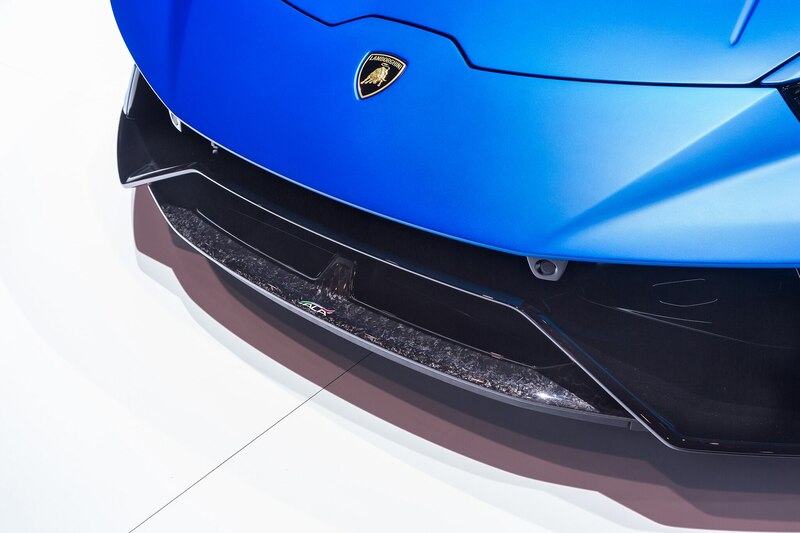 Such a person might also point out the incongruity of the cheap plastic on the steering wheel hub, so it’s probably best to kill them before they start talking. 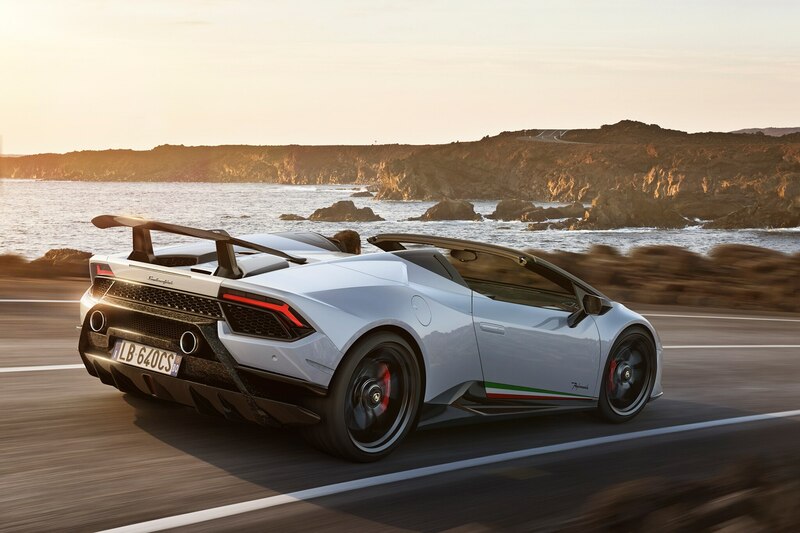 Anyone lucky enough to drive the Huracán Performante Spyder must experience launch mode. 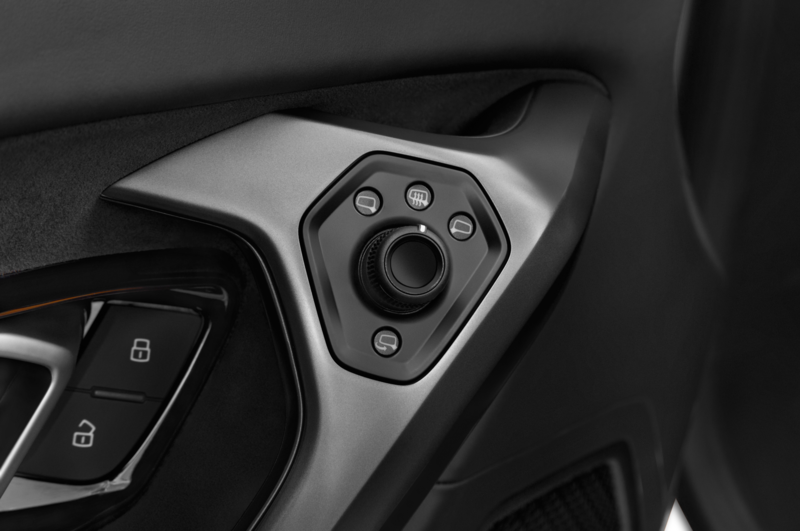 Set the drive mode switch to Corsa, disable ESC, then floor the brake and mat the accelerator. 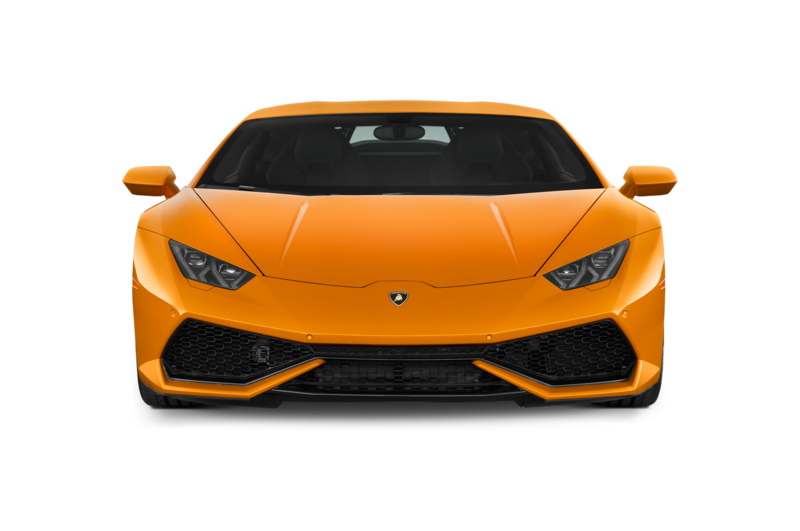 The engine howls at five grand and the transmission holds in neutral. 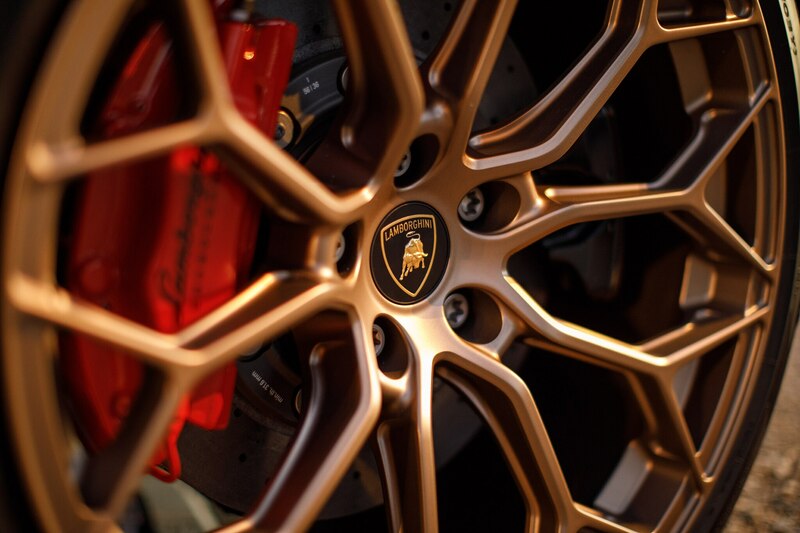 Release the brake and off you go. 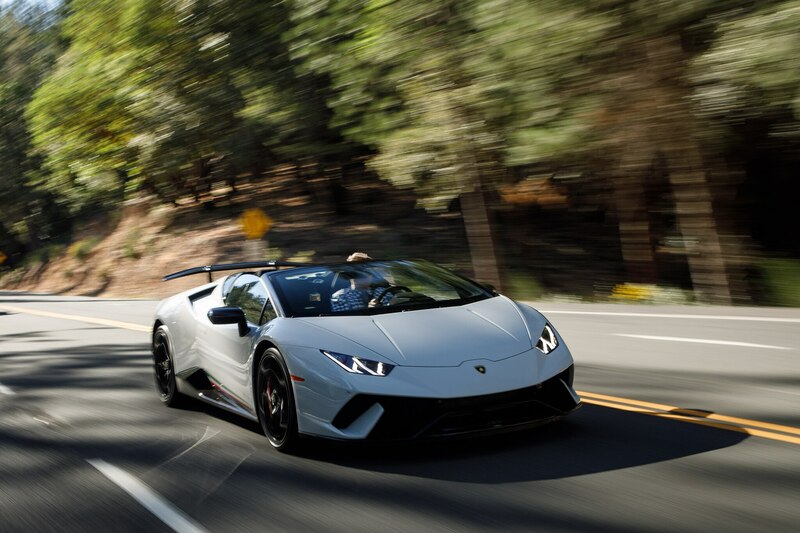 It is difficult to describe the experience of rocketing to 60 mph in three seconds, but it’s not as dramatic as you might expect: No wrenching of the stomach, no flattening of the face—one instant you’re standing still; the next, you’re at a mile-a-minute and gaining speed quickly. 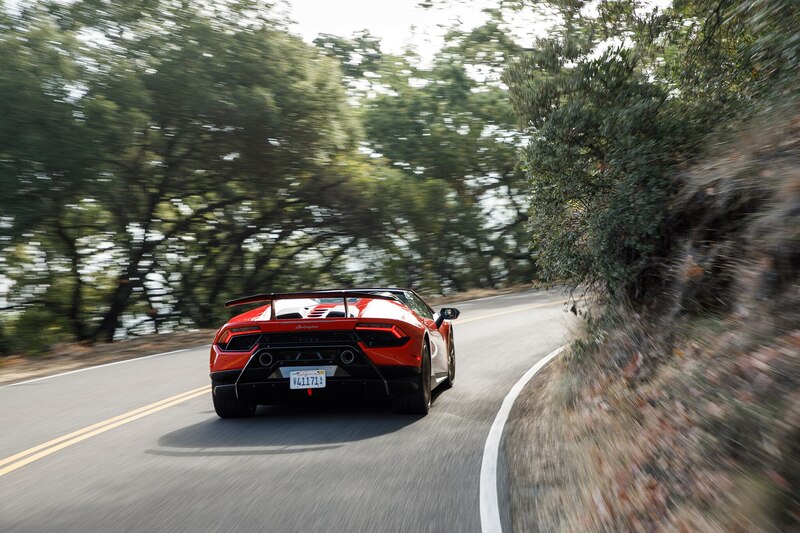 Flinging this car around the curves, however—that is as dramatic as you might expect. 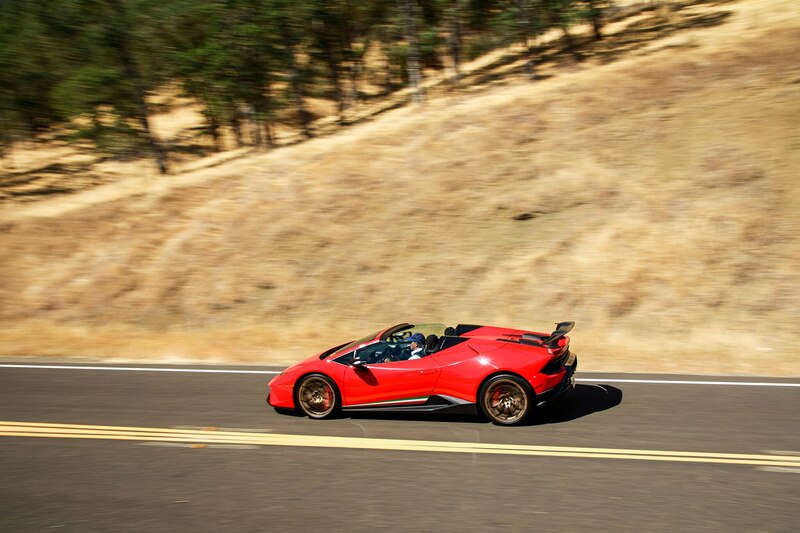 Acceleration is as quick as a motorcycle. 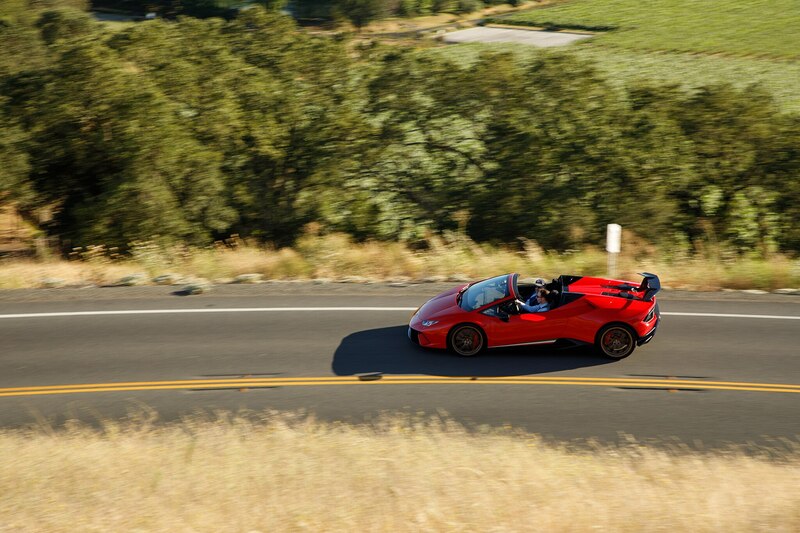 Grip feels limitless, and it may as well be; assuming you’re not driving like a complete imbecile, you need to push very hard on very sharp curves to get the Pirelli P Zero Corsas to give up their hold on the pavement. 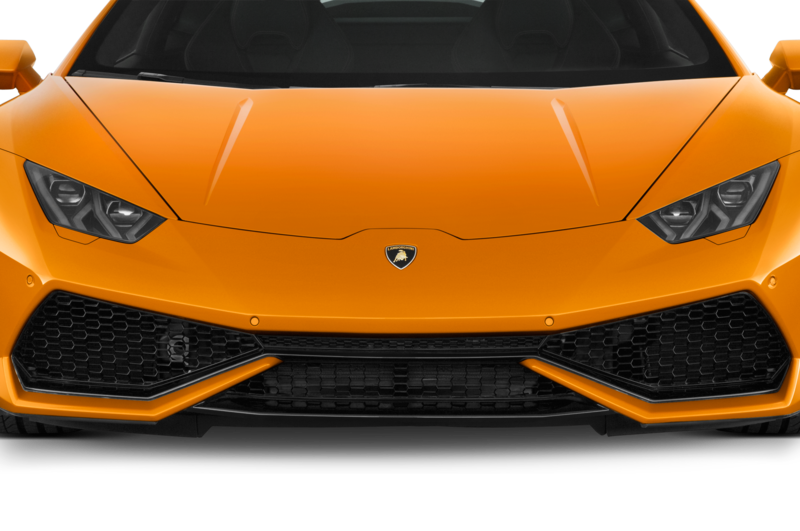 And you will want to push hard, because the steering is pretty darn near perfect—quick but not darty, hefty but not heavy, delivering feedback without kick-back. 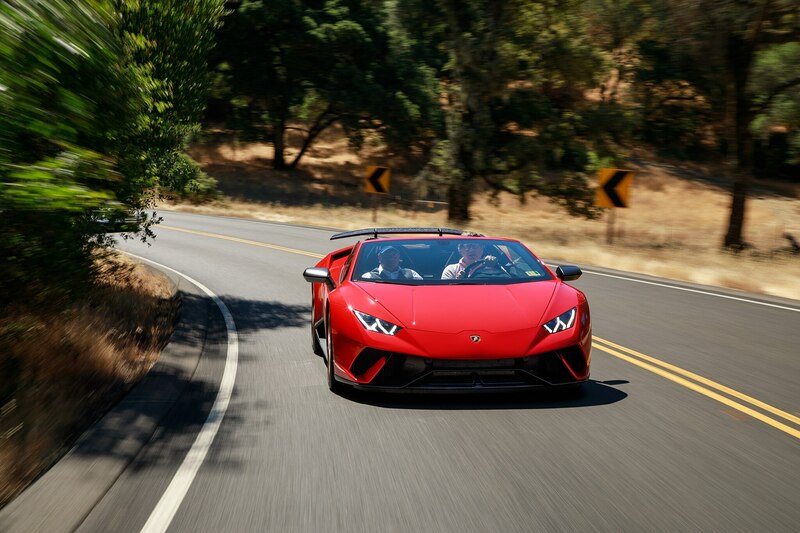 The ride is hard but not uncomfortable, at least until you hit really choppy pavement, where it becomes clear that when push comes to shove the Huracán prioritizes grip over comfort. 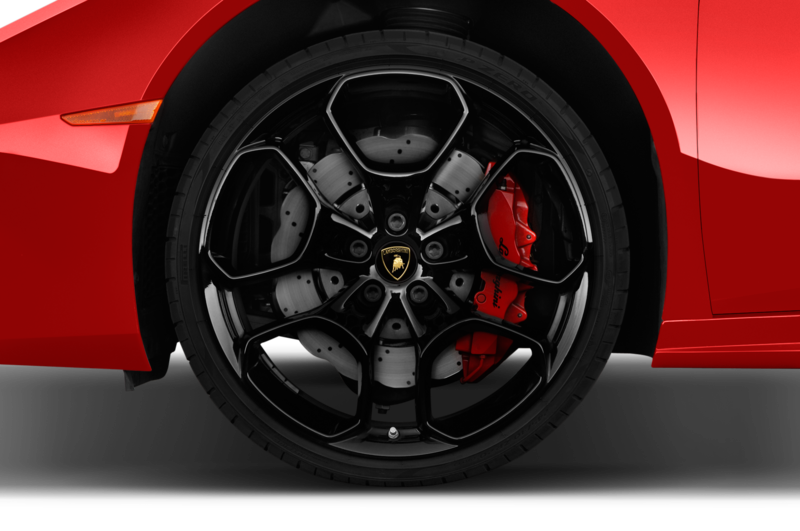 Carbon-fiber brakes powerful enough to stop time allow you to rapidly scrub speed when you suspect cops might be lurking ahead. 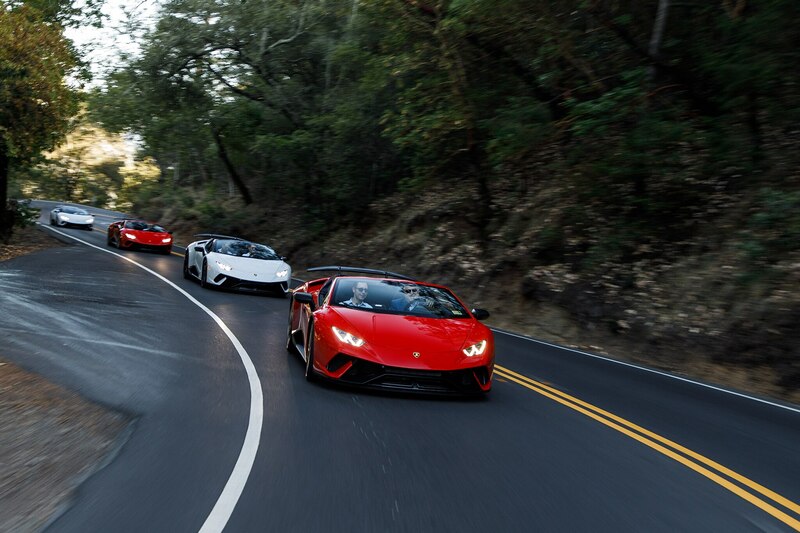 And the noise—oh, the noise! 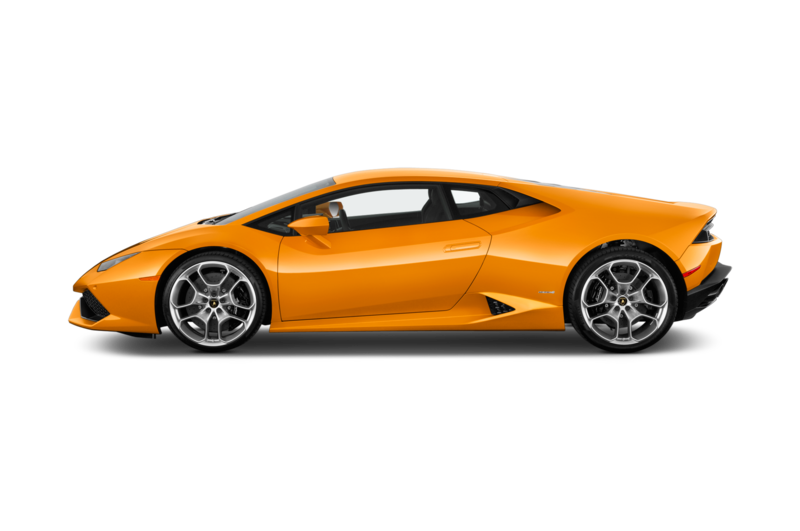 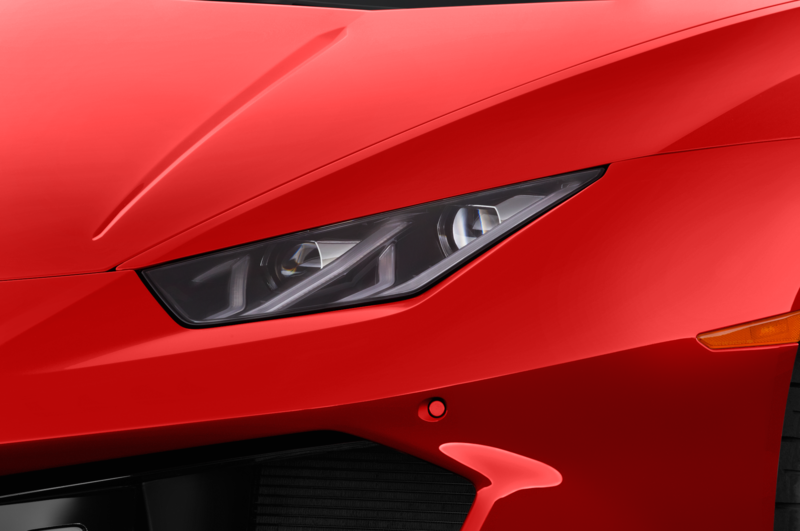 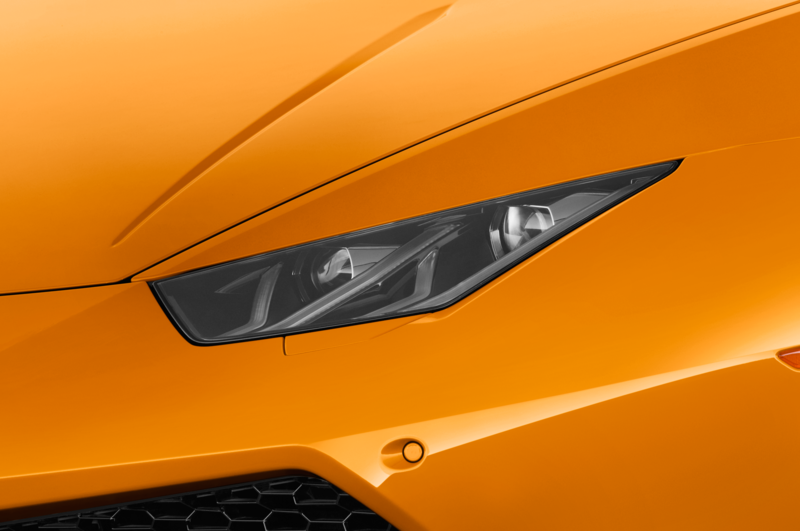 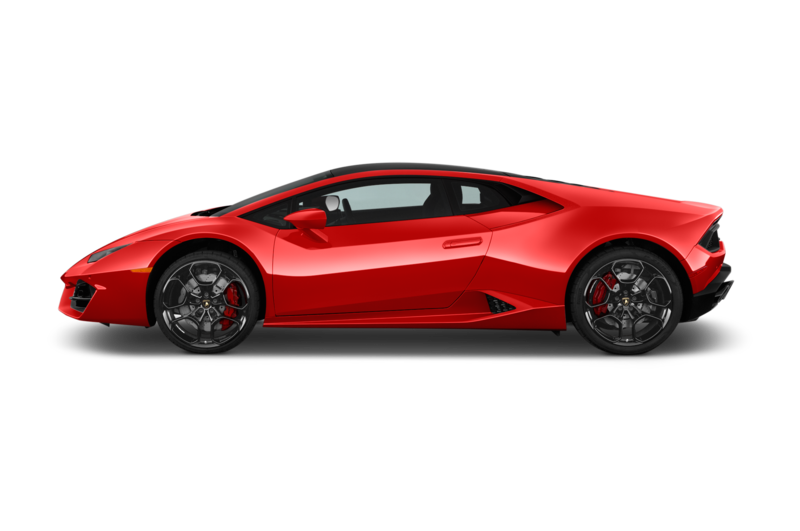 The Huracán has three drive modes, called Strada (street), Sport (you can guess), and Corsa (race). 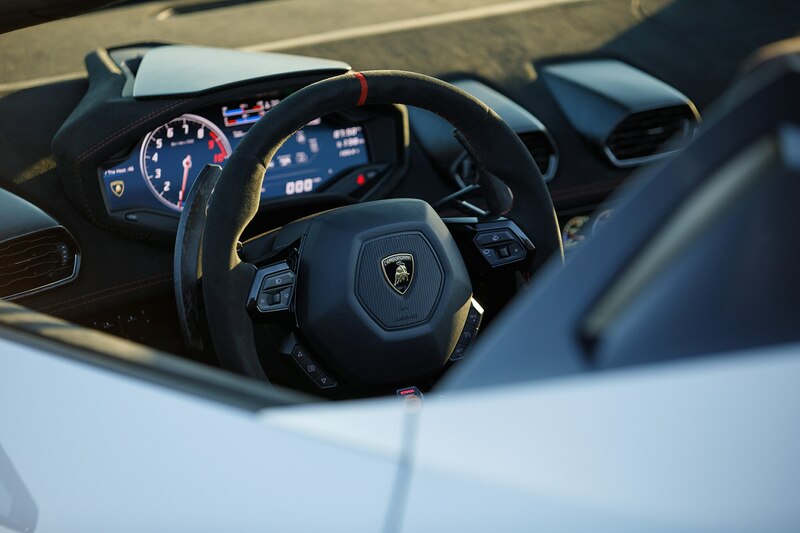 They change all the usual parameters—dampers, shift pattern, throttle response, dashboard display—but the one you’ll notice most is the soundtrack. 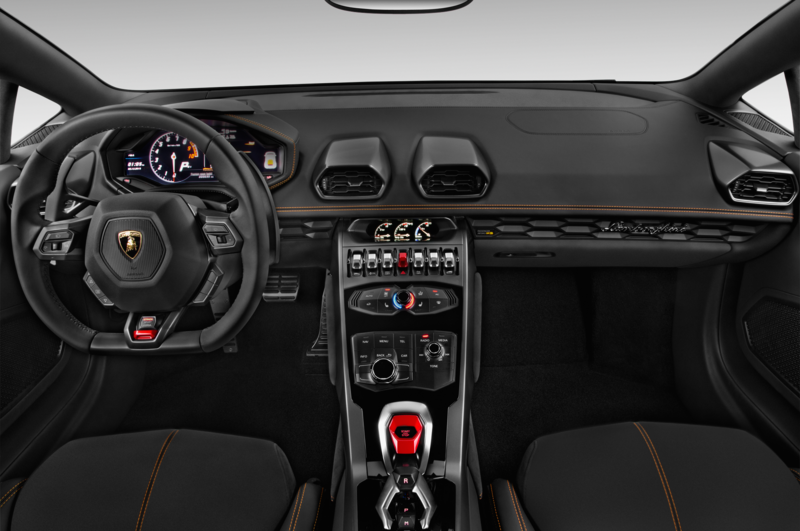 Strada is quieter than the other modes, in the sense that a Metallica concert is quieter than a Megadeath concert. 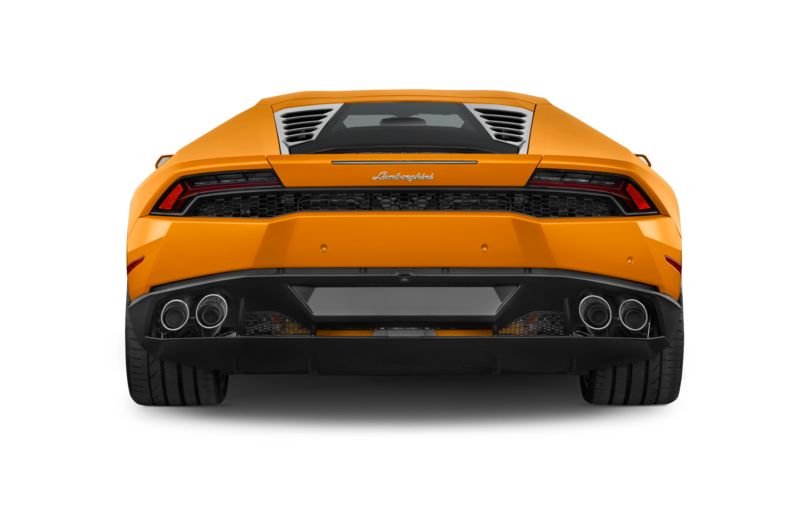 It mutes the exhaust somewhat, but like Luciano Pavarotti, when the Huracán sings, everyone is going to hear it. 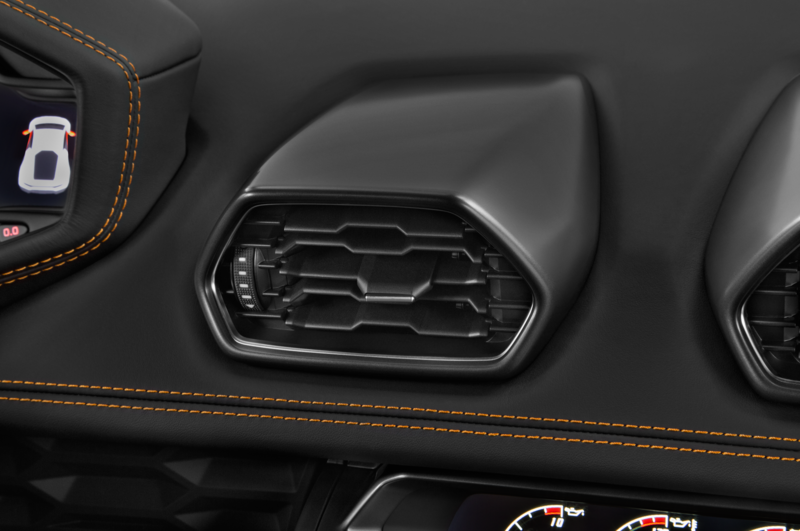 Sport opens up the exhaust and allows a fusillade of backfires every time you lift off the accelerator, while Corsa turns up the sliders on the equalizer. 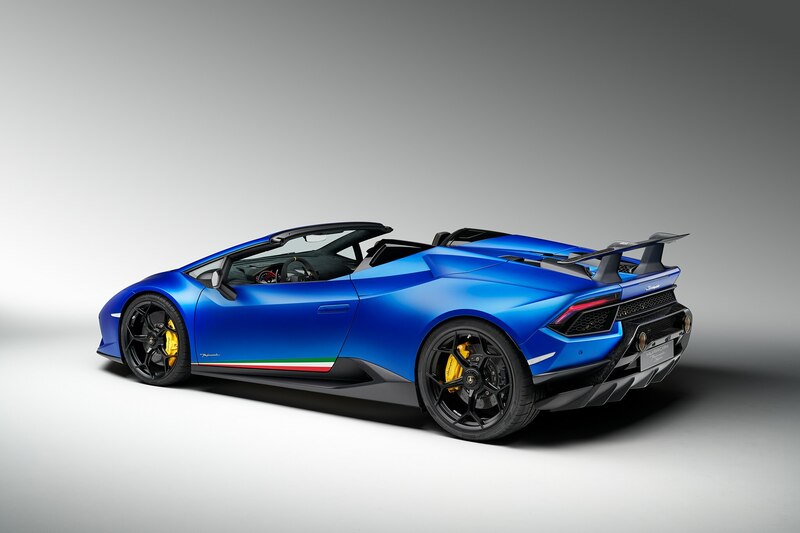 It is right and proper that we talk about sound, because that may be the best reason to get your Huracán Performante as a Spyder: With the top down, you can appreciate the big V-10 in all its glory, at least until your ears start bleeding. 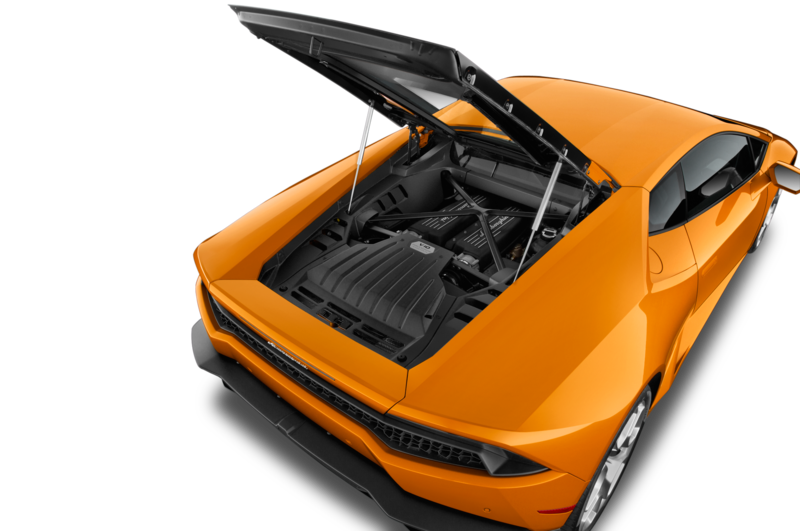 And appreciate it we should: A big naturally aspirated engine—especially one with ten cylinders—is an aural treat, a mellifluous soundtrack that is rapidly disappearing thanks to ever-increasing fuel economy and emissions standards. 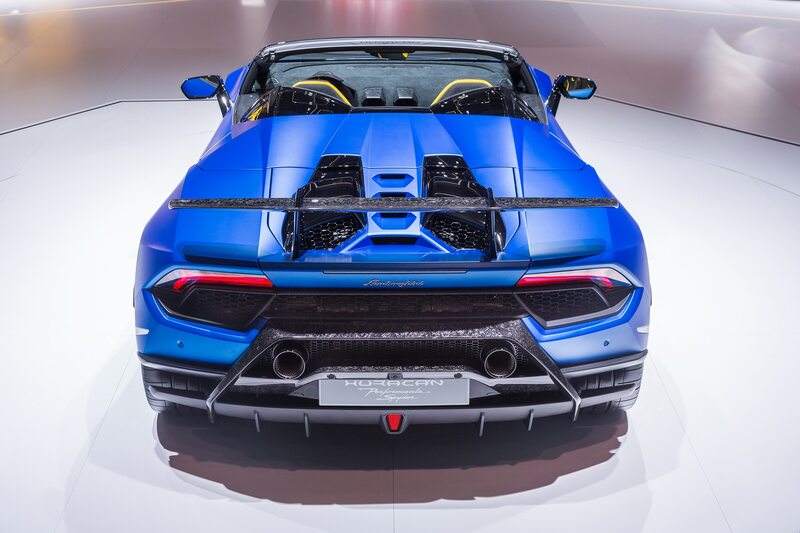 Turbochargers may be great for power, but they are also natural mufflers, which makes them instruments of the Devil. 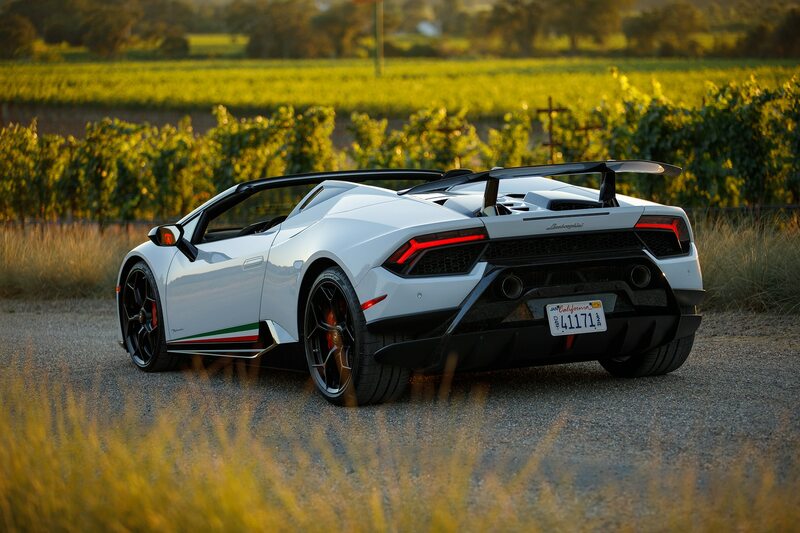 Aside from rain—which I am told by reliable sources does not occur in California (but it pours—man, it pours)—is there any good reason to drive this car with the roof in place? 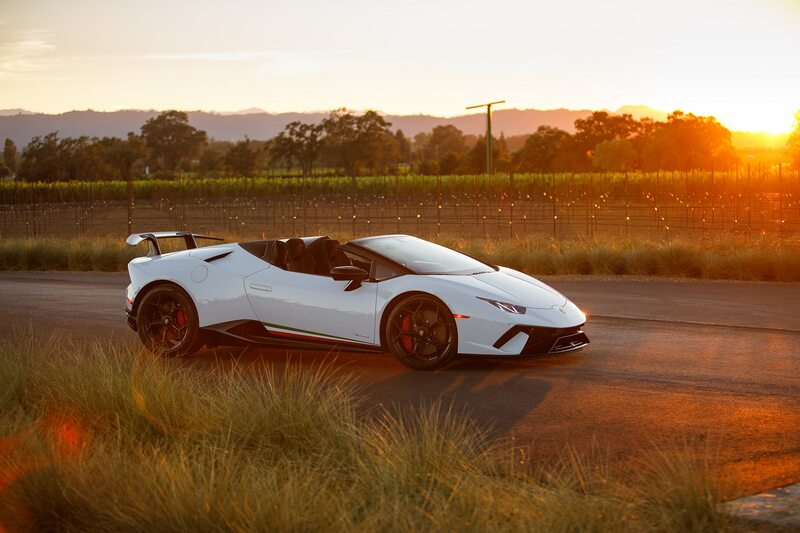 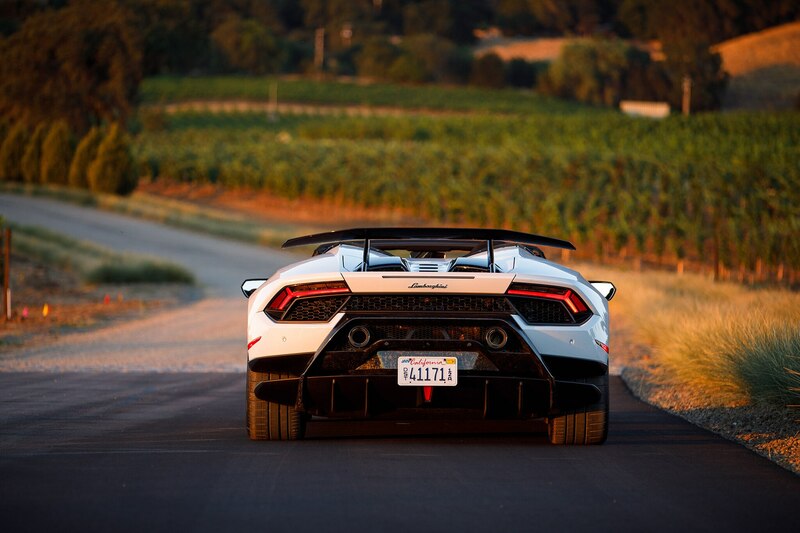 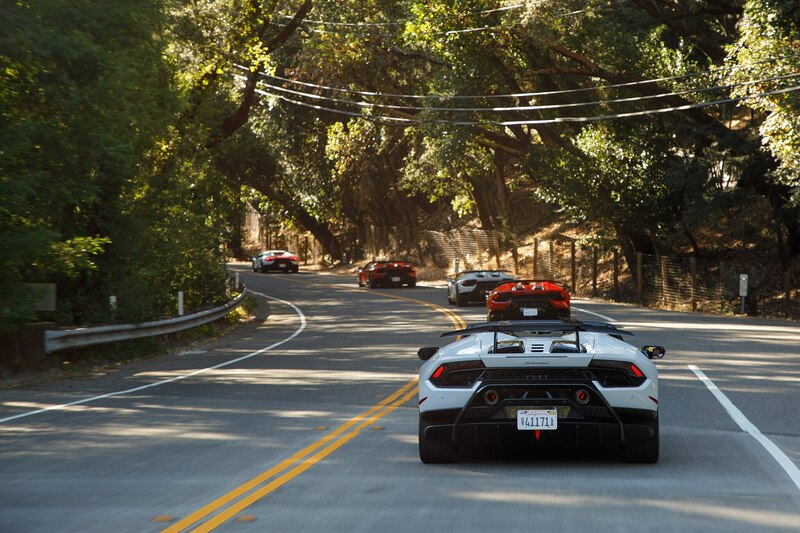 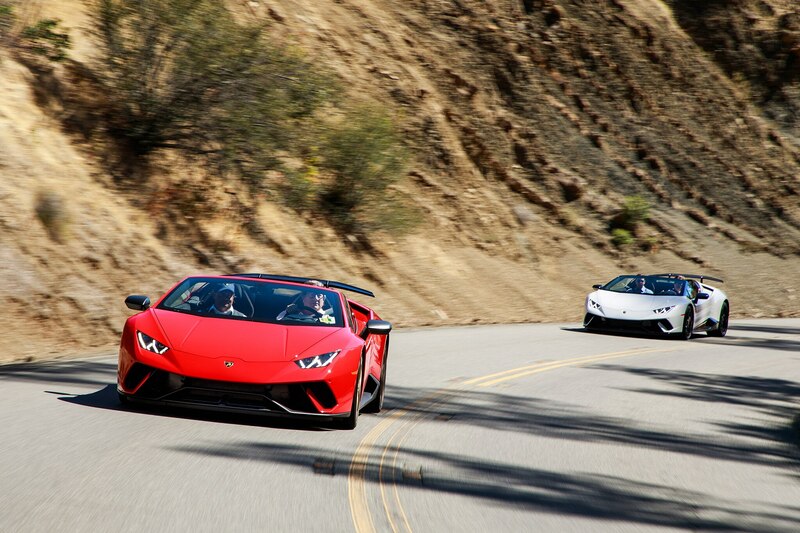 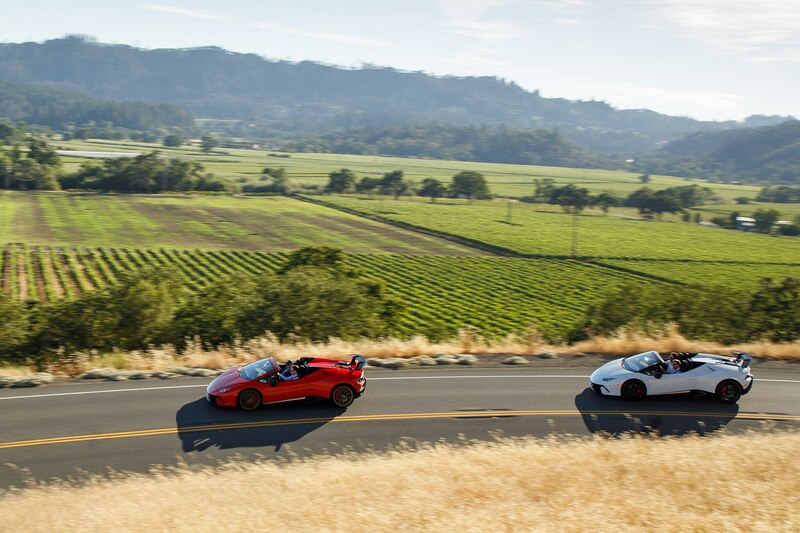 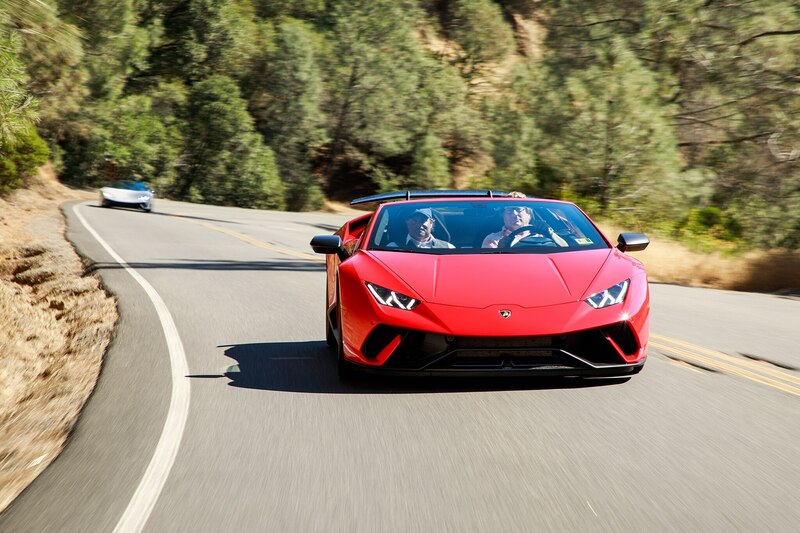 The Huracán offers one of the best top-down experiences on the road. 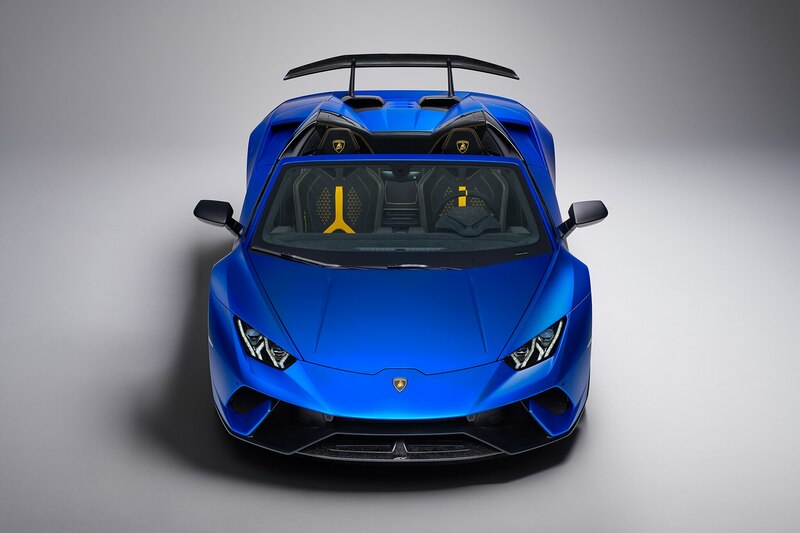 The windshield is set far forward, so even short people like me (5’6”), who often find themselves unwillingly sheltered by a swept-back windshield, can experience the sky above them. 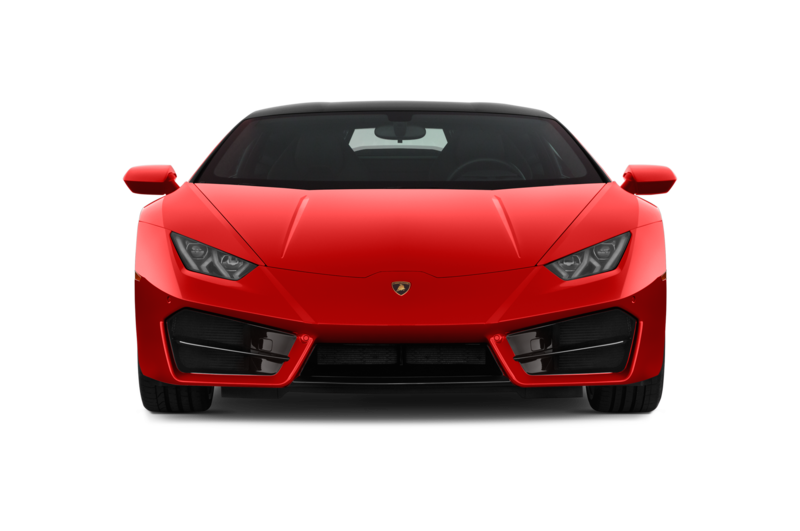 Buffeting is minimal, visibility is good, and as for wind noise, the engine is so damn deafening that it’s impossible to hear. 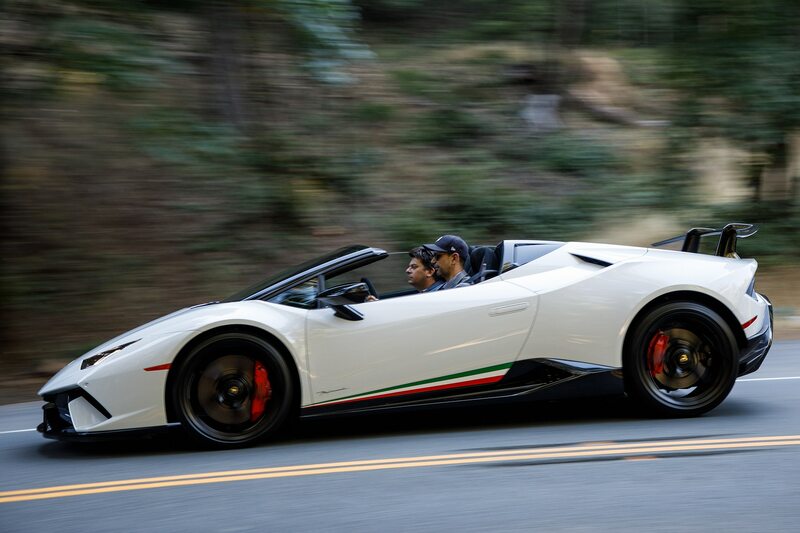 That said, I don’t see how anyone taller than me can really enjoy this car. 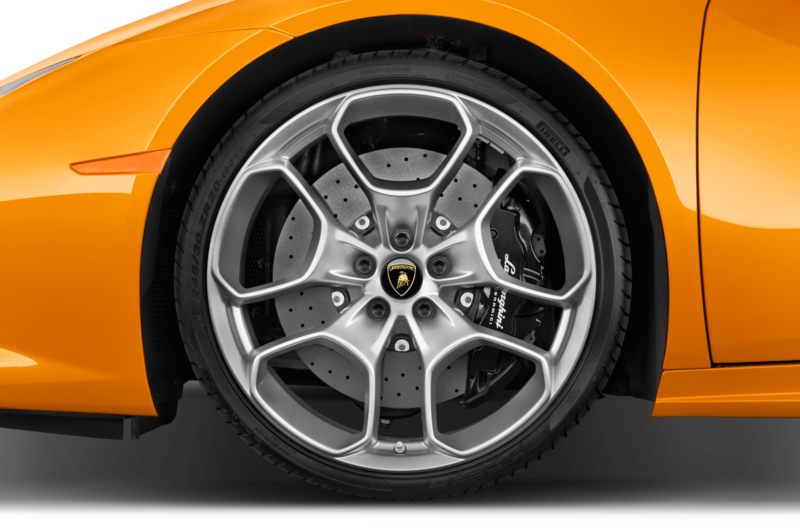 Six-footers may well find themselves staring right into the top of the windshield frame, their heads exposed to the slip-stream. 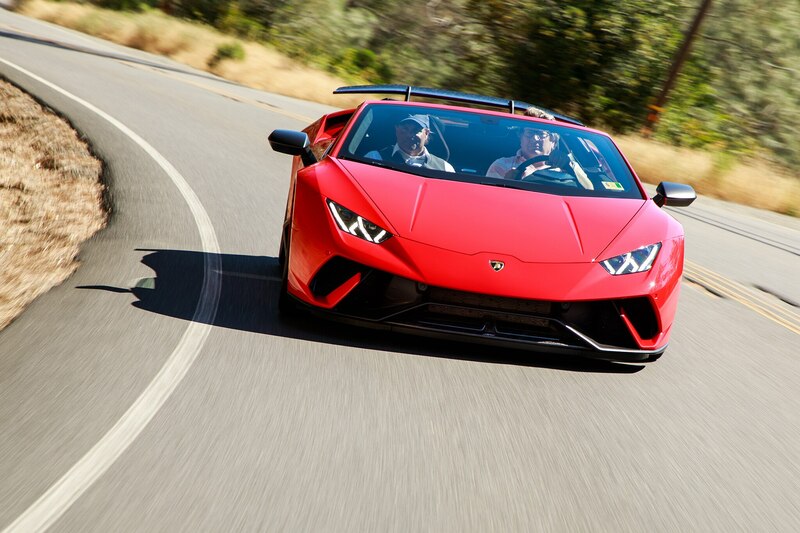 (My co-driver tried raising his adjustable seat and instantly lost his baseball cap to the wind.) 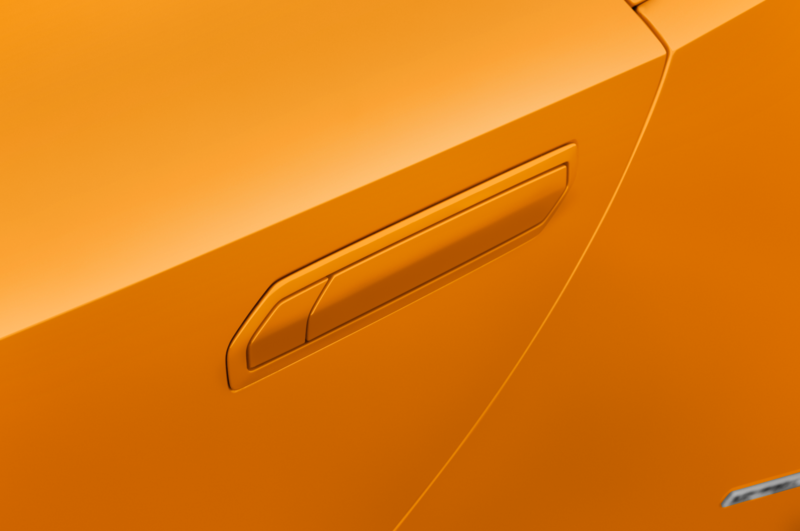 Despite my ridiculously short 29” inseam, I had to adjust the form-fitting buckets pretty far back. 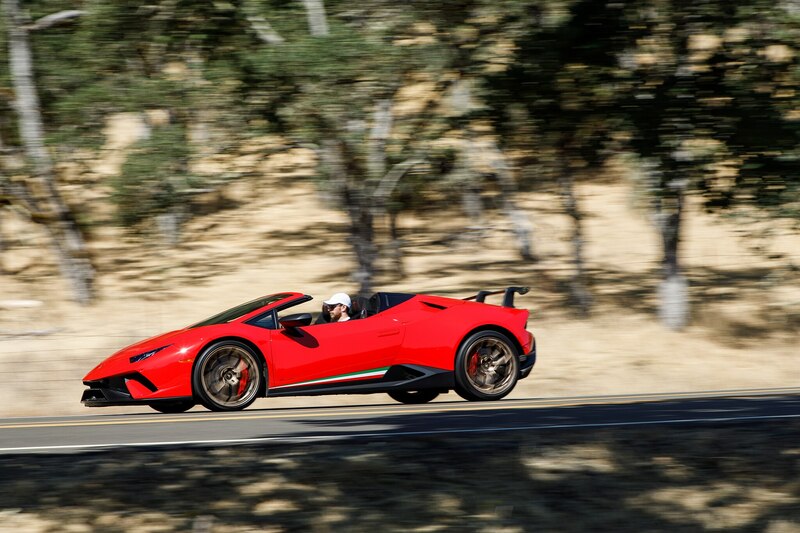 And while the Huracán Spyder is lovely with the top down, top up is another story. 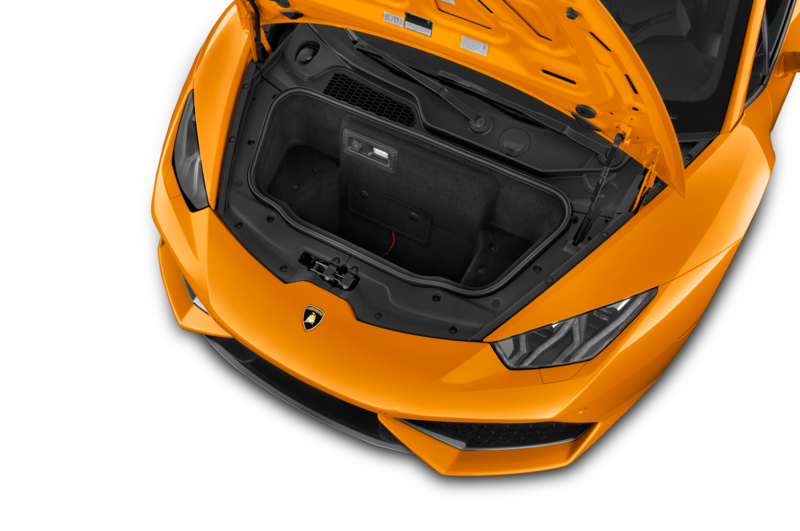 Closing the low-slung roof feels rather like being swallowed by a large fish. 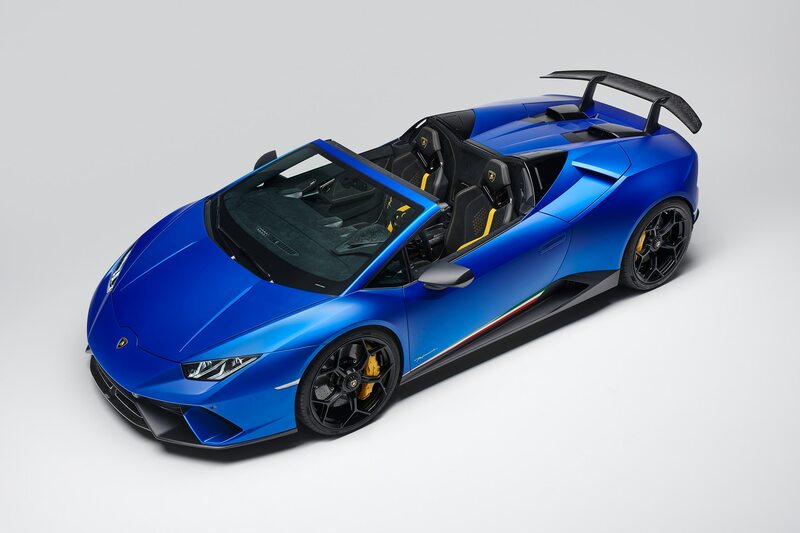 If you were hoping that putting the roof up would give you some respite from the Huracán’s turned-up-to-11 soundtrack, forget it: Top-up, the Spyder is an echo chamber, adding the din of road noise to the roar of the engine. 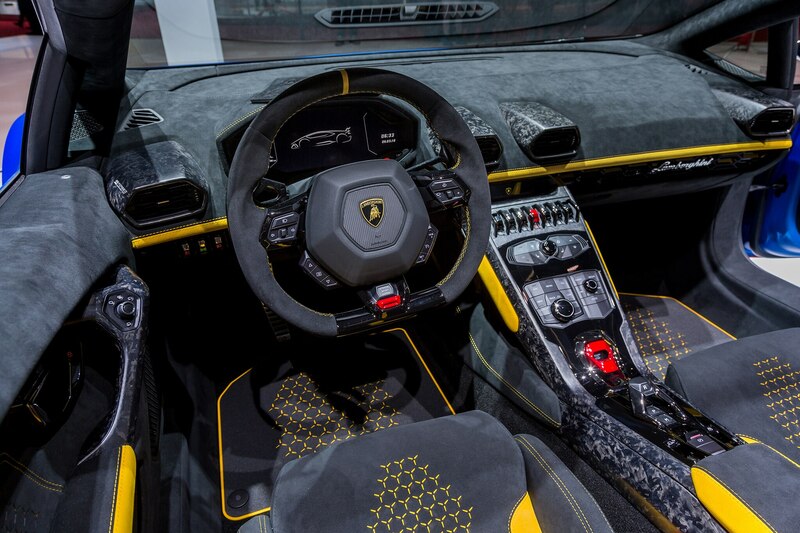 Since I’m already complaining like an ingrate, I’ll mention the cramped footwells and the ridiculous turn signal switch, a toggle on the steering wheel that must be pressed straight in to turn off after a lane change (because nothing is more embarrassing than driving a high-end Lamborghini with a forgotten left turn signal blinking away). 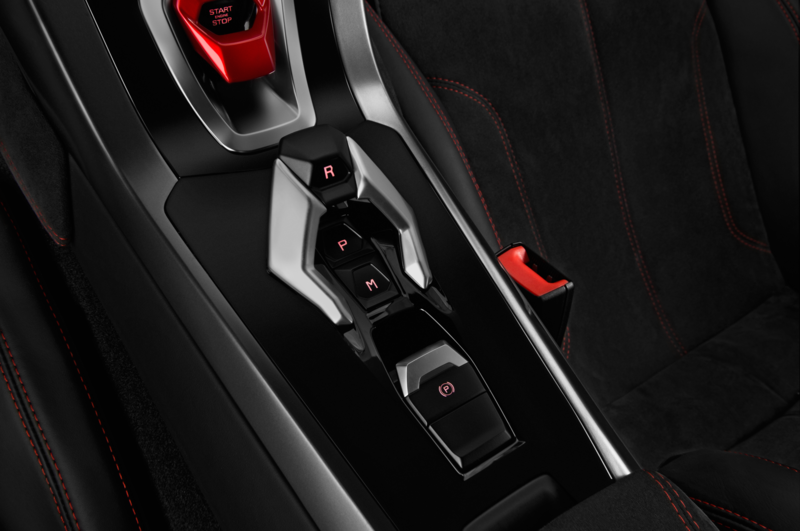 Switching the transmission from manual to automatic mode is a fiddly operation requiring a hard-to-reach button. 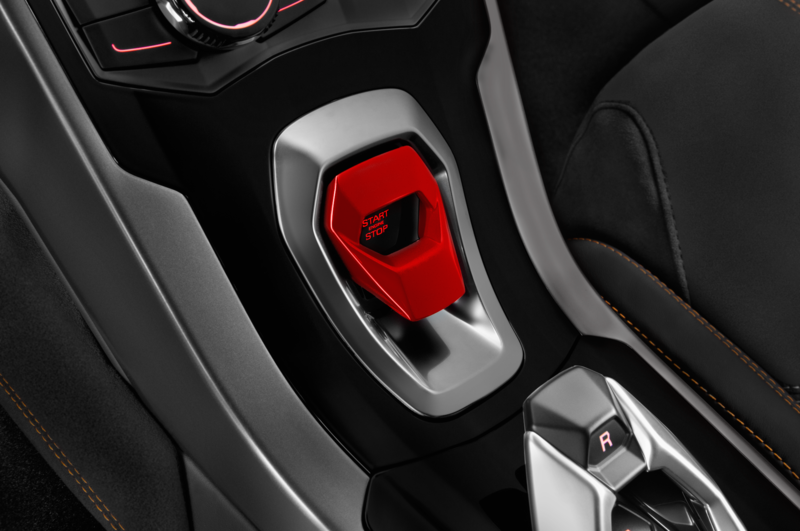 And why does the Corsa mode not allow automatic shifting? 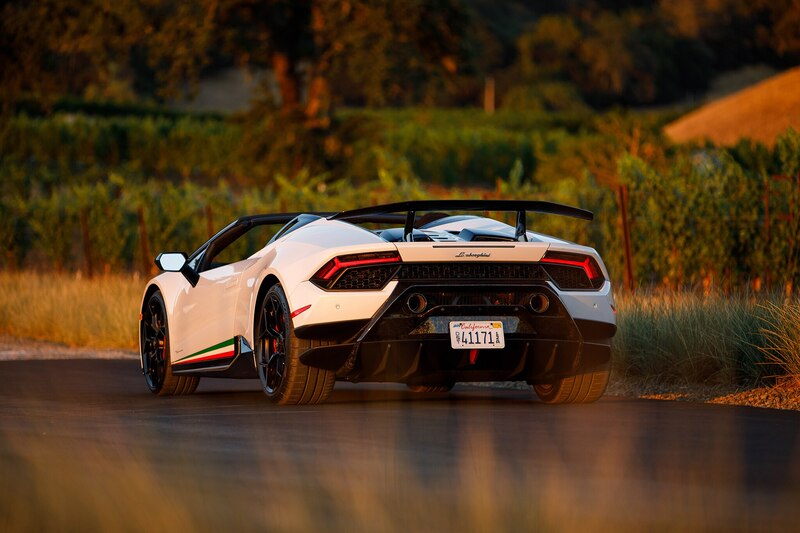 Trying to impress the locals with the exhaust at full bellow and then running into the rev limiter makes one look like a dolt. 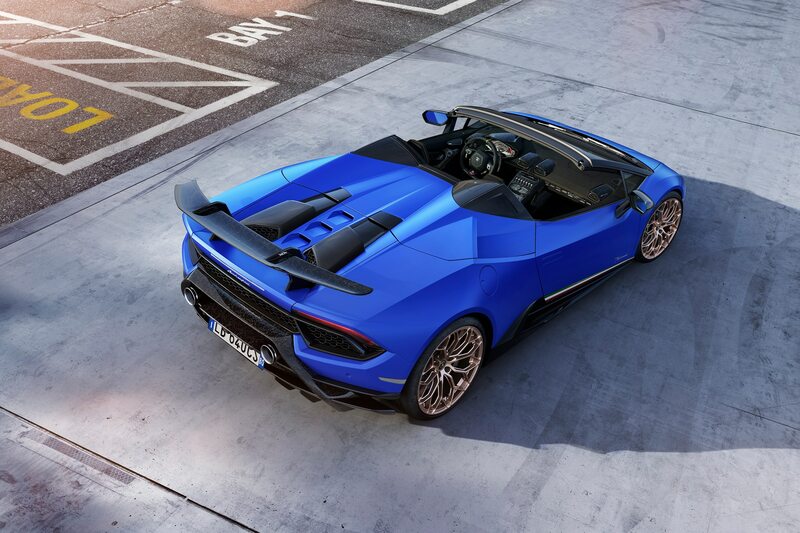 Forgive me for complaining, but it’s the only way I can detach myself from the Huracán Performante Spyder without acknowledging that I will probably never be able to afford the $309,000 asking price, let alone the $42,820 worth of options on my test car. 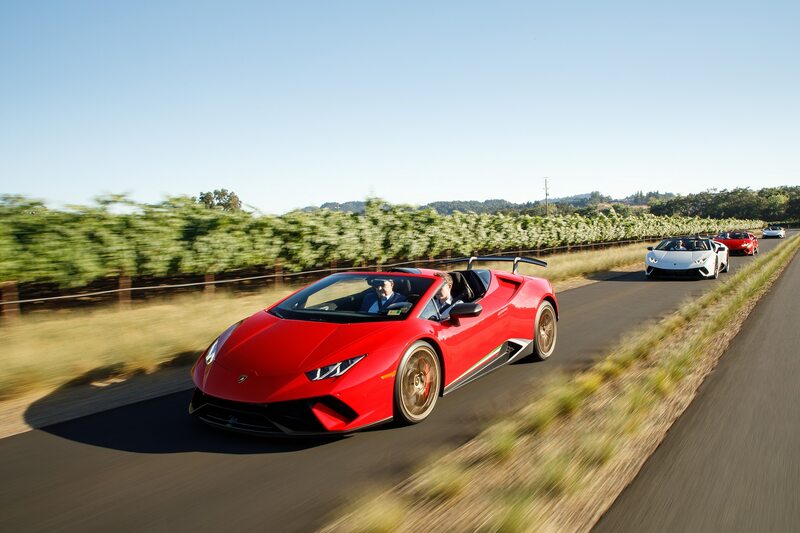 (I’m not even sure I could swing Lamborghini’s $3,695 destination fee.) 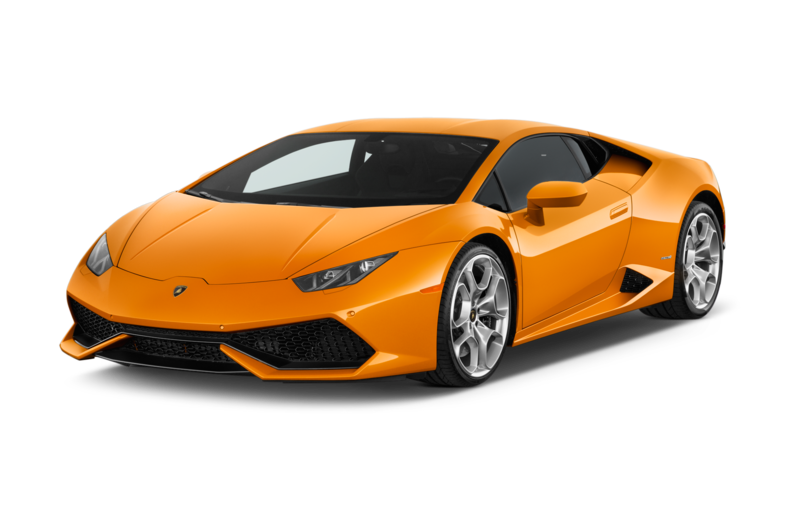 Still, a person can dream, and even live that dream, if only for a few hours. 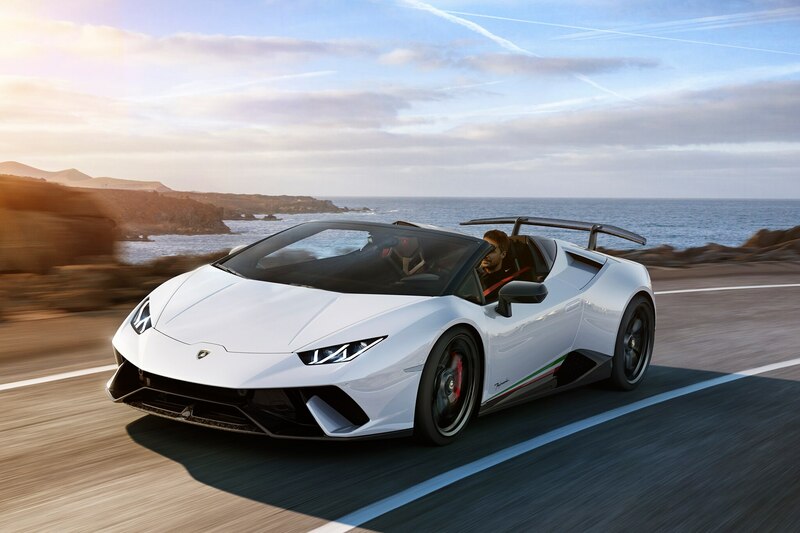 The 2018 Lamborghini Huracán Performante Spyder is the car of which dreams are made, but we all have to wake up sometime.